Which genomic innovations underpinned the origin of multicellular animals is still an open debate. Here, we investigate this question by reconstructing the genome architecture and gene family diversity of ancestral premetazoans, aiming to date the emergence of animal-like traits. Our comparative analysis involves genomes from animals and their closest unicellular relatives (the Holozoa), including four new genomes: three Ichthyosporea and Corallochytrium limacisporum. Here, we show that the earliest animals were shaped by dynamic changes in genome architecture before the emergence of multicellularity: an early burst of gene diversity in the ancestor of Holozoa, enriched in transcription factors and cell adhesion machinery, was followed by multiple and differently-timed episodes of synteny disruption, intron gain and genome expansions. Thus, the foundations of animal genome architecture were laid before the origin of complex multicellularity – highlighting the necessity of a unicellular perspective to understand early animal evolution. Hundreds of millions of years ago, some single-celled organisms gained the ability to work together and form multicellular organisms. This transition was a major step in evolution and took place at separate times in several parts of the tree of life, including in animals, plants, fungi and algae. Animals are some of the most complex organisms on Earth. Their single-celled ancestors were also quite genetically complex themselves and their genomes (the complete set of the organism’s DNA) already contained many genes that now coordinate the activity of the cells in a multicellular organism. The genome of an animal typically has certain features: it is large, diverse and contains many segments (called introns) that are not genes. By seeing if the single-celled relatives of animals share these traits, it is possible to learn more about when specific genetic features first evolved, and whether they are linked to the origin of animals. Now, Grau-Bové et al. have studied the genomes of several of the animal kingdom’s closest single-celled relatives using a technique called whole genome sequencing. This revealed that there was a period of rapid genetic change in the single-celled ancestors of animals during which their genes became much more diverse. Another ‘explosion’ of diversity happened after animals had evolved. Furthermore, the overall amount of the genomic content inside cells and the number of introns found in the genome rapidly increased in separate, independent events in both animals and their single-celled ancestors. Future research is needed to investigate whether other multicellular life forms – such as plants, fungi and algae – originated in the same way as animal life. Understanding how the genetic material of animals evolved also helps us to understand the genetic structures that affect our health. For example, genes that coordinate the behavior of cells (and so are important for multicellular organisms) also play a role in cancer, where cells break free of this regulation to divide uncontrollably. The transition from a unicellular organism to the first multicellular animal, more than 600 million years ago (Budd and Jensen, 2017; dos Reis et al., 2015), marks one of the most radical evolutionary innovations within the eukaryotes. Although multicellularity has independently evolved multiple times in the eukaryotic lineage, the highest levels of organismal complexity, body plan diversity and developmental regulation are found in the Metazoa (Grosberg and Strathmann, 2007). Key advances in the study of animal origins have been made by comparing the genomes of early branching metazoa, such as cnidarians, ctenophores or sponges (Putnam et al., 2007; Srivastava et al., 2010a; Moroz et al., 2014; Srivastava et al., 2008; Fortunato et al., 2014), with their closest unicellular relatives in the Holozoa clade, such as the choanoflagellates Monosiga brevicollis and Salpingoeca rosetta (King et al., 2008; Fairclough et al., 2013), and the filasterean Capsaspora owczarzaki (Suga et al., 2013) (Figure 1). By focusing on the transition, it is possible to determine which genomic innovations occurred at the origin of metazoa, and whether it required the invention of novel genes or structural features. Evolutionary framework and genome statistics of the study. (A) Schematic phylogenetic tree of eukaryotes, with a focus on the Holozoa. The adjacent table summarizes genome assembly/annotation statistics. Data sources: red asterisks denote Teretosporea genomes reported here; double asterisks denote organisms sequenced for this study; † previously sequenced genomes (King et al., 2008; Fairclough et al., 2013; Suga et al., 2013); ‡ organisms for which transcriptomic data exists but no genome is available (Torruella et al., 2015). (B) Overview of the phenotypic traits of each group of unicellular Holozoa, focusing on their multicellular-like characteristics. For further details, see (Torruella et al., 2015; Mendoza et al., 2002; Marshall et al., 2008; Glockling et al., 2013). Figure 1—source data 1 and 2. We now know that the animal ancestor was already a genomically complex organism, with a rich complement of genes encoding proteins related to a multicellular lifestyle. These include transcription factors, extracellular matrix components and intricate signaling pathways that were previously considered animal-specific, but were already poised to be co-opted for multicellularity when animals emerged (Fairclough et al., 2013; Suga et al., 2013; Richter and King, 2013; Manning et al., 2008; Suga et al., 2012; de Mendoza et al., 2013; Sebé-Pedrós et al., 2017). Suggestively, detailed analyses of the transcriptomic and proteomic regulatory dynamics of Capsaspora and Salpingoeca showed that these genes are frequently implicated in the transition to life stages reminiscent of multicellularity – aggregative in Capsaspora (Sebé-Pedrós et al., 2013, Sebé-Pedrós et al., 2016a), and clonal colonies in Salpingoeca (Fairclough et al., 2013). Furthermore, the genome architectures of extant Metazoa are, in many aspects, markedly different from most other eukaryotes: they have larger genomes (Elliott and Gregory, 2015a), containing more (Csuros et al., 2011) and longer introns (Elliott and Gregory, 2015a) that can sustain alternative splicing-rich transcriptomes (McGuire et al., 2008; Irimia and Roy, 2014), have richer complements of repetitive sequences such as transposable elements (Elliott and Gregory, 2015b) and are structured in ancient patterns of gene linkage associated with transcriptional co-regulation (Irimia et al., 2012; Simakov et al., 2013) – e.g., the Homeobox clusters (Ferrier, 2016). The relationship between these patterns of genome evolution and multicellularity is, however, unclear: these traits are not exclusive of animals (cf. (Curtis et al., 2012; Shoguchi et al., 2013; Michael, 2014; de Mendoza et al., 2015; French-Italian Public Consortium for Grapevine Genome Characterization et al., 2007)); the existence of secondarily reduced genomes in animals (smaller, gene-compact, less repetitive) in animals blurs their link with organismal complexity (Simakov and Kawashima, 2017; Seo et al., 2001; Petrov et al., 1996); and non-adaptive scenarios can explain the emergence of genomic complexities as a consequence drift-enhancing population-genetic environments (Lynch and Conery, 2003; Lynch, 2002, Lynch, 2007). Establishing the timeline of genome architecture evolution in the ancestry of Metazoa is thus essential to understand to which extent genomic complexity is linked to multicellularity. Overall, gene content has been extensively studied in the unicellular ancestry of animals, but less attention has been devoted to the evolution of genome architecture in this period – covering features such as the repetitive content, intron creation and synteny conservation (although cf. (King et al., 2008; Irimia et al., 2012)). This bias is partly due to the multi-million year gap separating animals from their unicellular relatives and the limited genome sampling of unicellular holozoans. We now know several examples of the effects of such limitations. For instance, our view of the transcription factor repertoire of the animal ancestor was confounded by the gene losses of Monosiga, which only became evident when Capsaspora genome was analyzed (Sebé-Pedrós et al., 2011); and the same happened with the ancestral animal diversity of cadherin and integrin adhesion systems before genomes from choanoflagellates and Capsaspora were analyzed (Nichols et al., 2012; Sebé-Pedrós et al., 2010). Therefore, comparative genomics studies are highly sensitive to taxonomic biases, meaning that rare genomic changes can remain elusive, and more frequent events can manifest saturated evolutionary signals. To overcome these limitations, we analyze the genomes of the third lineage of close unicellular relatives of animals, the Teretosporea, composed of Ichthyosporea and Corallochytrium limacisporum (Torruella et al., 2015). 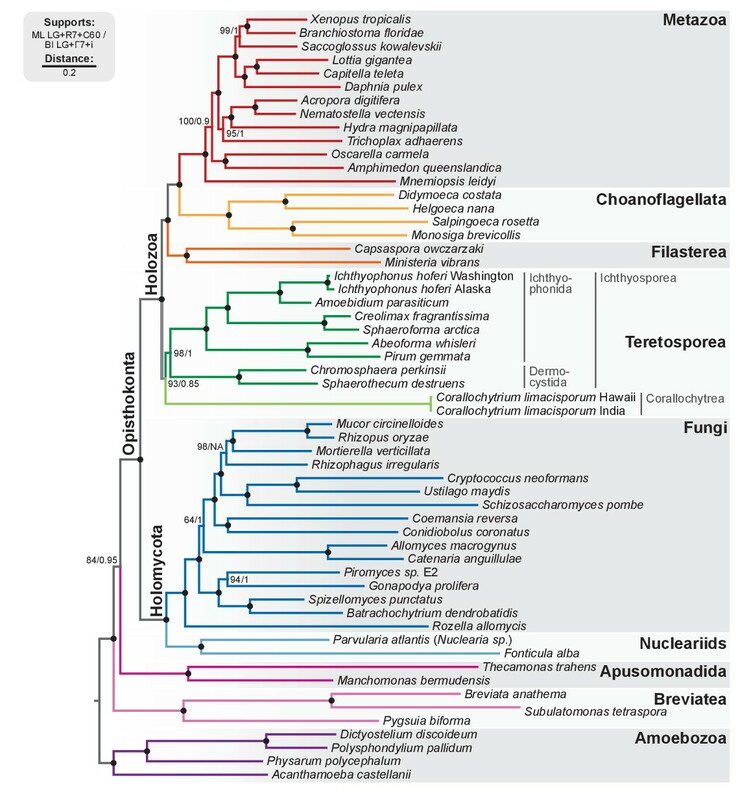 As the earliest-branching holozoan clade, Teretosporea are in a key phylogenetic position to complement our current view of premetazoan evolution. Interestingly, they display a developmental mode that radically differs from choanoflagellates and filastereans: many ichthyosporeans have a multinucleate coenocytic stage (Mendoza et al., 2002; Marshall et al., 2008), and Corallochytrium develops colonies by binary, palintomic, cell division (Raghukumar, 1987). In both cases, completion of the life cycle frequently involves release of propagules that restart the clonal proliferation (Mendoza et al., 2002; Marshall et al., 2008). In addition, the ichthyosporean Creolimax fragrantissima exhibits many features reminiscent of animals, such as transcriptional regulation of cell type differentiation or synchronized nuclei division during its development (de Mendoza et al., 2015; Suga and Ruiz-Trillo, 2013). Here, we present the complete genomes of four newly sequenced organisms: Corallochytrium limacisporum and the ichthyosporeans Chromosphaera perkinsii (gen. nov., sp. nov.), Pirum gemmata and Abeoforma whisleri. These are added to the already available Creolimax fragrantissima, Ichthyophonus hoferi and Sphaeroforma arctica (de Mendoza et al., 2015; Torruella et al., 2015) (Ichthyosporea), and to the afore-mentioned Salpingoeca rosetta, Monosiga brevicollis (choanoflagellates) and Capsaspora owczarzaki (Filasterea), totaling 10 unicellular holozoan genomes (Figure 1). Our aim is to provide new insights into the evolutionary dynamics of the genome in the ancestral unicellular lineage leading to animals, at two broad levels: gene family origin and diversification, and conservation of genome architectural features. We address the origin of the large and intron-rich animal genomes, changes in gene linkage (microsynteny), and ancient patterns of gene family diversification. The leitmotiv of these analyses is to identify and date genomic novelties along the ancestry of Metazoa, aiming to understand the foundations of the transition to multicellularity. The emerging picture from this comparative study is one of punctuated, differently-timed bursts of innovation in genome content and structure, occurring in the unicellular ancestry of animals. We obtained the complete nuclear genome sequences of Corallochytrium limacisporum and the ichthyosporeans Chromosphaera perkinsii, Pirum gemmata and Abeoforma whisleri. For all these taxa, we sequenced genomic DNA from axenic cultures using Illumina paired-end and mate-pair reads, which were assembled using Spades (Nurk et al., 2013). Gene annotation was performed using a combination of de novo gene predictions and transcriptomic evidence derived from RNA sequencing experiments (see Methods). Of the four genomes presented here, Corallochytrium (24.1 Mb) and Chromosphaera (34.6 Mb) have the highest completeness and contiguity (Figure 1). Specifically, Corallochytrium has 7535 genes and 83.4% of the BUSCO paneukaryotic gene set (a proxy to genome completeness (Simão et al., 2015)), and 75% of the assembly length is covered by 86 scaffolds (L75 statistic). Chromosphaera has 12,463 annotated genes comprising 85.5% of the BUSCO set, and its L75 statistic is 187 scaffolds. In contrast, Abeoforma and Pirum have larger genome assemblies (101.9 and 84.4 Mb), but these are fragmented (L75 = 25,133 and 25,440 scaffolds) and incomplete (11.9% and 17.0% of BUSCO). These lower contiguities are reflected in their partial gene predictions (Figure 1A, Figure 1—figure supplement 1), which consequently hindered the detection of BUSCO orthologs. Overall, together with Capsaspora, the two choanoflagellates and three already available ichthyosporeans, our expanded dataset now comprises 10 genomes from all unicellular Holozoa lineages – eight more than in previous genome analyses (Fairclough et al., 2013; Suga et al., 2013). To have a robust phylogenetic framework for our comparative analyses, we investigated the phylogenetic relationships between holozoans with a phylogenomic analysis based on the dataset developed in Torruella et al. (2015). We classified the newly identified Chromosphaera perkinsii (gen. nov., sp. nov.) as a member of Ichthyosporea, in the order Dermocystida, as it clusters with Sphaerothecum destruens in our phylogenomic analysis (Figure 2; BS = 100%, BPP = 1). Therefore, Chromosphaera, isolated from shallow marine sediments in Hawai'i, is the first described putatively free-living dermocystid Ichthyosporea. Indeed, all described dermocystids are strict vertebrate parasites, whereas ichthyophonids are typical animal commensals or parasites (although free-living species have been described and some have been identified in environmental surveys of marine microbial eukaryotic diversity) (del Campo and Ruiz-Trillo, 2013; Glockling et al., 2013). Phylogenomic analysis of the BVD57 taxa matrix. Tree topology is the consensus of two Markov chain Monte Carlo chains run for 1231 generations, saving every 20 trees and after a burn-in of 32%. Statistical supports are indicated at each node: (i) non-parametric maximum likelihood ultrafast-bootstrap (UFBS) values obtained from 1000 replicates using IQ-TREE and the LG + R7+C60 model; (ii) Bayesian posterior probabilities (BPP) under the LG+Γ7 + CAT model as implemented in Phylobayes. Nodes with maximum support values (BPP = 1 and UFBS = 100) are indicated by a black bullet. See Figure 2—figure supplement 1 for raw trees with complete statistical supports. Figure 2—source data 1. Our analysis confirms our previous results with regards to the phylogenetic relationships within Holozoa: the Teretosporea, comprising Ichthyosporea and the small free-living osmotroph Corallochytrium (Raghukumar, 1987), are a sister-group to all the other holozoans (filastereans, choanoflagellates and animals) with improved statistical support (Figure 2; BS = 93%, BPP = 0.85). The monophyly of Teretosporea rejects alternative scenarios such as the ‘Filasporea’ hypothesis (a grouping of Filasterea + Ichthyosporea) (Ruiz-Trillo et al., 2008; Liu et al., 2009) or the status of Corallochytrium as an independent opisthokont lineage. We found that Metazoa typically have larger genomes than their unicellular relatives: early-branching animals are within the 300–500 Mb range (Elliott and Gregory, 2015a; Simakov and Kawashima, 2017) and most unicellular holozoans have relatively compact genomes, like Corallochytrium, Capsaspora or Chromosphaera (24.1, 27.9 and 34.6 Mb, respectively; Figure 3A). There are, however, a few exceptions in the Ichthyosporea: Sphaeroforma, Abeoforma, Pirum and Ichthyophonus have genomes in the 84.4–120.9 Mb range (using assembly length as a proxy to genome size), sometimes larger than some secondarily simplified early-branching animals like Trichoplax adhaerens (~100 Mb) or Oscarella carmela (57 Mb; Figure 3A) (Srivastava et al., 2008; Simakov and Kawashima, 2017). Patterns of genome evolution across unicellular Holozoa. (A) Genome size and composition in terms of coding exonic, intronic and intergenic sequences of unicellular holozoan and selected metazoans. Percentage of repetitive sequences shown as black bars. Genome size of the Metazoa LCA (gray bar) from (Simakov and Kawashima, 2017) (exonic, intronic and intergenic composition not known). (B) Profile of TE composition for selected organisms. Density plots indicate the sequence similarity profile of the TE complement in each organism. Embedded pie-charts denote the relative abundance, in nucleotides, of the main TE superclasses in each genome: retrotransposons (SINE, LINE and LTR), DNA transposons (DNA) and unknown. Nc: total number TE copies in the genome; Nf: number of families to which these belong; P25f and P75f: percentage of most-frequent TE families that account for 25% and 75% of the total number of TE copies, respectively. (C) Heatmap of pairwise microsynteny conservation between 10 unicellular holozoan genomes. Species ordered according the number of shared syntenic genes (Euclidean distances, Ward clustering). At the right: selected pairwise comparisons of syntenic single-copy orthologs between unicellular holozoan genomes. Numbers denote number of syntenic genes, total number of single-copy orthologs, and proportions (%) of syntenic genes per the compared orthologs. Circle segments are scaffolds sharing ortholog pairs, connected by gray lines. (D) Phylogenetic distances between unicellular holozoans and four selected animals: Homo sapiens, Nematostella vectensis, Trichoplax adhaerens and Amphimedon queenslandica. Red asterisks denote organisms that have lower phylogenetic distances to metazoans than one (single asterisk) or both choanoflagellates (double asterisks) (p value < 0.05 in Wilcoxon rank sum test). † indicates significantly higher distances between Corallochytrium and metazoans. Figure 1—source data 1, Figure 3—source data 1, 2 and 3. A parsimonious scenario for genome size evolution would imply an holozoan ancestor with a fairly compact genome, in line with the values of Corallochytrium, Capsaspora and Chromosphaera (24.1–34.6 Mb), followed by secondary genome expansions in ichthyosporeans (the stem lineage of ichthyophonids, and then again in individual species) and possibly Salpingoeca (55.4 Mb). The largest unicellular holozoan assembled genomes fall short of the inferred C-values of ancestral Metazoa (~300 Mb) (Simakov and Kawashima, 2017), thus indicating another genome expansion at the origin of multicellularity. Transposable element (TE) invasions partially explain the inflations in genome size and can carry the signal of the independent expansions (Elliott and Gregory, 2015b). Indeed, 5–9% of the genome of Salpingoeca, Sphaeroforma, Abeoforma and Pirum are covered by TEs, whereas other holozoans are below 2.5% (Figure 3A). Unicellular holozoan have diverse TE complements, ranging between 42 families in Corallochytrium to >400 in Pirum or Abeoforma (Figure 3—figure supplement 1; [Carr and Suga, 2014]); and ~31% of these families are shared with metazoan genomes (Figure 3—figure supplement 2). In Salpingoeca, Pirum and Abeoforma, we found species-specific small sets of TE families, sharing high sequence identity, that accounted for the vast majority of copies (Figure 3B). This signaled recent TE invasions, and, therefore, independent contributions to genome expansion. There were hints of older TE propagation events in Sphaeroforma and Pirum, with a long tail of low-similarity TE copies (Figure 3B). In Abeoforma and Pirum, TEs and other simple repeats comprised up to 17% and 34% of the genome, accompanied by unusually AT-biased nucleotide compositions (Figure 1A). However, the exact repetitive fraction of Abeoforma and Pirum genomes cannot be exactly quantified: their highly repetitive nature has contributed to their fragmented and incomplete assemblies (Figure 1A, Figure 1—figure supplement 1) (Treangen and Salzberg, 2011), which hinders the annotation of TEs and simple repeats. Finally, the smaller genomes of Corallochytrium and Chromosphaera were largely depleted of repetitive/satellite regions and TEs (1.8% and 3.8% of their genomes). This finding, together with their reduced intron content (see below, Figure 4) suggests a secondary streamlining process. (A) Distribution of intron lengths and number of introns per gene in selected eukaryote genomes. Dots represent median intron lengths and vertical lines delimit the first and third quartiles. Color code denotes taxonomic assignment. Species abbreviation as in Figure 1 and Figure 2—source data 1. (B) Fraction of the genome covered by introns and exons in selected eukaryotes. Dotted line represents the identity between both values. Color code denotes taxonomic assignment. Figure 1—source data 1. Ancestral conservation of gene linkage at the local level (microsynteny) is common in Metazoa, frequently due to coordinated cis-regulation (Irimia et al., 2012; Simakov et al., 2013). Following this reasoning, we analyzed the microsyntenic gene pairs of unicellular holozoan genomes (Figure 3C), expecting higher degrees of conservation within lineages than across them. This hypothesis held true for the Salpingoeca-Monosiga genome pair, but we found little or no conservation in almost all inter-specific comparisons of ichthyosporeans and Corallochytrium. There were, however, two exceptions: Creolimax-Sphaeroforma (sibling species; 907 syntenic orthologous genes) and, to a lesser extent, Chromosphaera-Corallochytrium (72 genes). In the case of the closely-related Pirum and Abeoforma, their fragmented genomes hindered the gene order analyses and yielded low synteny conservation values. In contrast, the analysis of microsynteny in Capsaspora revealed remarkable across-lineage conservation with the distant teretosporeans Chromosphaera and Corallochytrium (142 and 129 genes, respectively). Moreover, and to a lesser degree, Capsaspora also retains a few shared linked gene pairs with Trichoplax, the cnidarians Aiptasia sp., Nematostella vectensis, and the sponges Amphimedon queenslandica and Oscarella carmela (Figure 3C, Figure 3—figure supplement 3). A notable example of ancestral microsynteny is that of integrins: heterodimeric transmembrane proteins involved in cell-to-matrix adhesion and signaling in animals that are also present in unicellular Holozoa (de Mendoza et al., 2015; Sebé-Pedrós et al., 2010). Indeed, integrin-α and integrin-β genes from Corallochytrium (one pair) and Capsaspora (four pairs) are in a conserved head-to-head arrangement of likely holozoan origin. Incidentally, Capsaspora's pairs of collinear α/β integrins co-express during its life cycle (Sebé-Pedrós et al., 2013), a typical cause of microsynteny conservation in animals (Irimia et al., 2012). Overall, gene linkage of most extant holozoans appears to be markedly different from their common ancestor, with specific gene pairings arising in Metazoa (Irimia et al., 2012; Simakov et al., 2013), choanoflagellates and some ichthyophonids. In contrast, Capsaspora harbors a relatively slow-evolving genome in terms of synteny conservation. Finally, we examined the level of coding sequence conservation between unicellular holozoans and animals. We aimed to contrast the patterns of conservation at the structural level (outlined above) with those of the genic regions. Using 143 phylogenies of paneukaryotic orthologous genes, we examined the pairwise distances between unicellular holozoans and Homo sapiens (bilaterian), Amphimedon (sponge), Nematostella (sea anemone) and Trichoplax (placozoan) (Figure 3D). In all comparisons, Capsaspora, Chromosphaera and Ichthyophonus accumulated fewer amino-acidic substitutions per alignment position than choanoflagellates since their divergence from animals (p<0.05 in Wilcoxon rank sum test). Conversely, Corallochytrium was singled out as the taxon with more cumulative amino acid differences with animals. Thus, the analysis of coding sequence conservation across holozoans—a genomic trait fundamentally unrelated to synteny—also attests to Capsaspora's slower pace of genome change. Intron-rich genomes are a hallmark of Metazoa. Indeed, the last common ancestor (LCA) of Metazoa is inferred to have had the highest intron density among eukaryotes, due to a process of continuous intron gain starting in the last eukaryotic common ancestor (LECA) (Csuros et al., 2011; Carmel et al., 2007). The high intron density of multicellular animals has been linked to their higher organismal complexity, as it enables frequent alternative splicing (AS) and richer transcriptomes (Rogozin et al., 2012; Barbosa-Morais et al., 2012; Irimia et al., 2009; Nilsen and Graveley, 2010), provides physical space for transcription regulatory sites (Le Hir et al., 2003; Sebé-Pedrós et al., 2016b), and facilitates the diversification of gene families by exon shuffling (Liu et al., 2005). The dominance of weak splice sites inferred at the intron-rich ancestral Metazoa reinforces the proposed role of alternative splicing as an important source of transcriptomic innovation at the dawn of animal multicellularity (Csuros et al., 2011; Irimia et al., 2007). Our expanded set of unicellular holozoan genomes provides an ideal framework to investigate the emergence of the high intron densities found in animal genomes. Our survey of intron richness across eukaryotes identifies a high number of introns per gene in many ichthyosporeans, choanoflagellates and animals (Figure 4A). Moreover, Creolimax and Ichthyophonus harbor longer introns than most protistan eukaryotes, similar in length to those of some animals (Figure 4B). These similarities between ichthyosporeans and animals suggest two possible scenarios: (1) an early intronization event at the origin of Holozoa followed by reduction in some unicellular lineages (e.g., Capsaspora or Corallochytrium); or (2) independent episodes of intron proliferation in Metazoa, Choanoflagellata and Ichthyosporea. To test these hypotheses, we assembled a set of 342 paneukaryotic orthologs from 40 complete genomes and analyzed the conservation of their intron sites according to the maximum likelihood method developed by Csűrös and Miklós (2006) (Figure 5—figure supplement 1). This analysis supports the second hypothesis and reveals two independent periods of intense intron gain in unicellular holozoans: at LCA of Metazoa and Choanoflagellata, and in the branch leading to ichthyophonid Ichthyosporea (Figure 5A–B). After animals and choanoflagellates diverged, intron gains independently persisted in both lineages. (A) Rates of intron gain and loss per lineage, including extant genomes and ancestral reconstructed nodes. Diameter and color of circles denote the number of introns per kbp of coding sequence at each ancestral node. Bolder edges mark the lines of descent between the LECA and Metazoa/Ichthyophonida, which were characterized by continued high intron densities (see text). Red and green bars represent the inferred number of intron gains (green) and losses (red) in ancestral nodes. 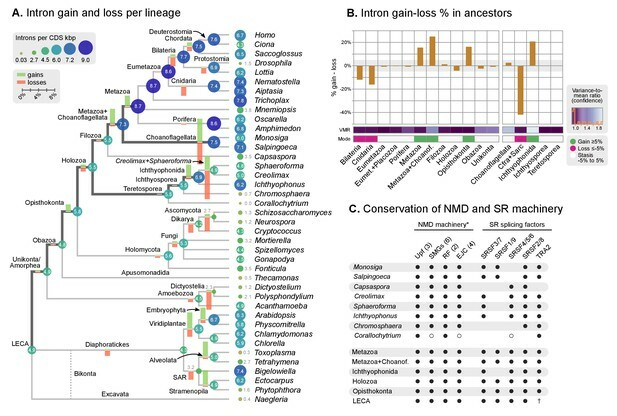 (B) Difference between intron site gains and losses in selected ancestors, including animals (left; from Metazoa to Unikonta/Amorphea) and unicellular holozoans (right). For each ancestor, we specify the variance-to-mean ratio of the inferred number of introns from 100 bootstrap replicates (higher values, denoted by lighter purple, indicate less reliable inferences; see Methods. The color code denotes modes of intron evolution: dominance of gains (green), losses (pink) and stasis (light gray). (C) Conservation of the NMD machinery and SR splicing factors in unicellular holozoans (up) and selected ancestors (down). Black dots indicate the presence of an ortholog, and empty dots partial conservation. For the NMD machinery, each column summarizes the presence of multiple gene families (number between brackets). † denotes the ancestral eukaryotic origin of TRA2 according to (Plass et al., 2008). Complete survey at the species and gene levels available as Figure 4—figure supplements 2 and 3. Figure 5—source data 1, 2 and 3. Our reconstruction shows that, since the origin of introns in the LECA, most ancestors were dominated by intron loss while a few remain in an equilibrium, static or dynamic (consistent with previous studies [Csuros et al., 2011; Rogozin et al., 2012]) (Figure 5B). A prolonged process of intron gain can be observed, however, in the lines of descent from the LECA (4.9–5.5 introns per kbp of coding sequence) to Ichthyophonida (6.9 introns/CDS kbp) and Metazoa LCAs (8.7 introns/CDS kbp), interrupted by phases of stasis with slight intron loss, such as in the Filozoa or Holozoa LCAs (Figure 5A–B). The existence of independent intronization events in ancestral holozoans is supported by a hierarchical clustering analysis of the intron presence/absence profile across extant and ancestral genomes (Figure 6A; Ward clustering from Spearman correlation-based distances). First, most intron-rich animals form a cluster with Salpingoeca and Monosiga that also includes the LCAs of Metazoa and Metazoa + Choanoflagellata. Second, ichthyosporeans and Corallochytrium, although phylogenetically closely-related to each other, are highly divergent in their pattern of shared introns: the intron-dense Creolimax and Sphaeroforma form an independent cluster that differs from the Holozoa LCA; whereas Corallochytrium and Chromosphaera undergo independent secondary simplifications (from 5.5 introns/CDS kbp in the Teretosporea LCA, to 0.0 and 0.7, respectively). In contrast, Ichthyophonus (intron-rich) and Capsaspora have lower intron loss rates and are more similar to older eukaryotic ancestors, from Holozoa to the LECA (Figure 6A). In Ichthyophonus, retention is accompanied by a high gain rate, giving intron densities similar to some modern animals (7.1 intron/CDS kbp). In contrast, Capsaspora (3.5 intron/CDS kbp) appears to have undergone little ancestral reconfiguration of its gene architecture: there is an equilibrium between few losses and gains at the root of Filozoa (Figure 5A), and 85.5% of its introns are of holozoan or earlier origin (Figure 6B). Interestingly, introns with regulatory sites from Capsaspora (identified in [Sebé-Pedrós et al., 2016b]) have a similar, ancestral-biased, age distribution (Fisher's exact test, p-value=1; Figure 6B). This hints at a decoupling between the evolutionary dynamics of introns and regulatory sites, despite sharing physical space in the genome. 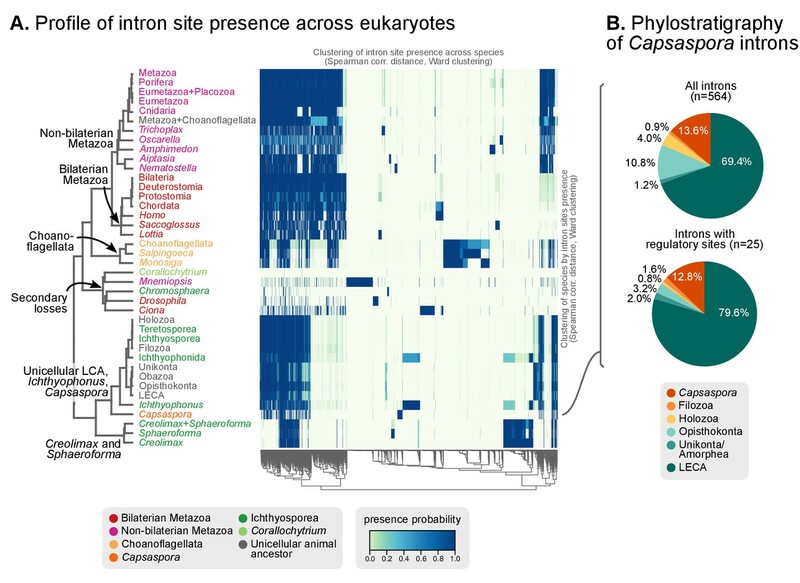 Profile of intron site presence across eukaryotes. (A) Heatmap representing presence/absence of 4312 intron sites (columns) from extant and ancestral holozoan genomes, plus the line of ascent to the LECA (rows). Intron sites and genomes have been grouped according to their respective patterns of co-occurrence (dendrogram based on Spearman correlation distances and Ward clustering algorithm; see Methods). The dendrogram of genome clusterings is shown to the left. Figure 5—source data 2. (B) Phylostratigraphic analysis of the origin of Capsaspora introns, considering all sites (left) and those with putative regulatory sites (right; after [Sebé-Pedrós et al., 2016b]). The evolutionary implications of intron gain episodes in Holozoa remain an open question. High intron densities have been linked to inefficient purifying selection: according to the mutational-hazard hypothesis, the lower effective population sizes of animals preclude the loss of slightly deleterious intronic sequence – which can constitute an impediment to genome replication or precise transcription (Csuros et al., 2011; Lynch and Conery, 2003; Lynch, 2002, Lynch, 2006). Whether this population-genetic effect is also connected with the intron gains in Creolimax, Sphaeroforma and Ichthyophonus, however, is unclear: their specific effective population sizes are not known, but estimates from their close relative Sphaeroforma tapetis are in line with typical unicellular eukaryotes (in the 106 to 107 range [Marshall and Berbee, 2010]) and thus higher than most animals (Lynch, 2006). Alternatively, holozoans’ intron gains could be linked to adaptive roles related to alternative splicing (AS): intron-dense genomes exhibit AS-rich transcriptomes (Irimia and Roy, 2014), which can increase proteomic diversity (Barbosa-Morais et al., 2012; Nilsen and Graveley, 2010; Bush et al., 2017) or fine-tune gene expression regulation (Lareau et al., 2007; He and Jacobson, 2015). Transcriptomes of complex animals frequently feature exon skipping events that conduce to multiple protein isoforms per gene (McGuire et al., 2008; Irimia and Roy, 2014; Bush et al., 2017). In contrast, the AS profiles of Creolimax and Capsaspora are dominated by intron retention (affecting 24.9% and ~33% of their genes, respectively), which can disrupt the transcripts’ open reading frames (Sebé-Pedrós et al., 2013; de Mendoza et al., 2015). Intron retention is present in virtually all intron-bearing eukaryotes, pointing at an early origin in evolution (Irimia and Roy, 2014). Consequently, AS events in the intron-rich Creolimax were proposed to be involved in down-regulation of gene expression (de Mendoza et al., 2015) by a mechanism akin to the nonsense-mediated decay (NMD) pathway that operates in other eukaryotes (Lareau et al., 2007; He and Jacobson, 2015; Braunschweig et al., 2014; Kerényi et al., 2008). In order to explore the relationship between intron evolution and AS-based transcriptome regulation, we surveyed the conservation in unicellular holozoans of the NMD protein complex and key splicing factors involved in AS (Figure 5C, Figure 5—figure supplement 2 and 3). The core NMD toolkit (consisting of the Upf1-3, Smg1, Smg5/6/7 and Smg8/9 genes; the release factors 1 and 3; and the exon-junction complex [EJC] [He and Jacobson, 2015]) has a pan-eukaryotic distribution (Figure 5C-Figure 5—figure supplement 2A), as previously reported for the wider spliceosomal molecular machinery (Collins and Penny, 2005). The NMD toolkit was also fully conserved in the LCAs of Ichthyophonida, Metazoa and Metazoa + Choanoflagellata – which underwent the above-reported intron gain episodes (Figure 5A). Similarly, the SR splicing factors (serine/arginine-rich proteins, termed SRSF1-9 and TRA2A/B in humans), which are involved in splice site recognition in metazoan AS (Plass et al., 2008; Sanford et al., 2005), also appeared early in eukaryotic evolution and were conserved in LCAs ranging from Opisthokonta to Metazoa (Figure 5C, Figure 5—figure supplement 2B). Interestingly, Corallochytrium secondarily lost part of its NMD machinery and SR splicing factors (e.g., it lacks three out of four EJC components, and only possesses one canonical SR gene) concomitantly with its acute intron losses – a process that mirrors the depletion of splicing factors in the intron-depleted ascomycete Saccharomyces cerevisiae (Plass et al., 2008). Thus, we found that the intron gain episodes of the LCAs of ichthyophonids and animals occurred in ancestral holozoans that were potentially able to perform NMD of aberrant transcripts. The Monosiga genome paper by King et al. (2008) revealed that much of the innovation in gene content seen in the transition to multicellularity is rooted in pervasive 'tinkering' with preexisting gene families, notably by rearrangements of protein domains. This mechanism, combined with gene duplication, allows for a functional diversification of gene families by tuning the interactions with other components of the cell—its substrate specificities, sub-cellular localization or partnerships with other proteins within larger complexes. Albeit protein domain rearrangements are not uncommon in eukaryotes (Basu et al., 2008, Basu et al., 2009; Leonard and Richards, 2012), this process is specifically credited with the diversification of many gene families involved in complex signaling and/or multicellular integrated lifestyle in Metazoa (Suga et al., 2012; Simakov and Kawashima, 2017; Sebé-Pedrós et al., 2010; Tordai et al., 2005; Ekman et al., 2007; Hynes, 2012; Deshmukh et al., 2010; Grau-Bové et al., 2015). Here, we present a comprehensive study of gene diversification in Holozoa, using our taxon-rich genomic dataset to reconstruct its effect in the animal ancestry. We thus performed a comparative analysis of protein domain architectures across eukaryotes, using the rates of domain rearrangement (or shuffling) as a proxy for gene family diversification. We compared the phylogenetic distribution of protein domain co-occurrences across species and gene families (using a dataset comprising 26,377 gene families or clusters of orthologs derived from 40 eukaryotic species (see Methods). We inferred rates of domain rearrangement at ancestral nodes of the eukaryotic tree using a probabilistic birth-and-death model (Csűrös and Miklós, 2006) to reconstruct the content of specific protein domain architectures in ancestral genomes (available as Figure 7). In our approach, pairs of domains can create novel combinations ('gain') that diversify existing gene families, or dissociate domains ('loss'), which results in decreased diversity of multi-domain proteins. (A) Protein domain combination gain and loss per lineage, including extant genomes and ancestral reconstructed nodes. Diameter and color of circles denote the number of different domain combinations (in different gene families) in that node of the tree. Bolder edges mark the line of descent between the LCAs of Opisthokonta and Bilateria, which was generally dominated by gains of protein domain combinations (see text). Red and green bars represent the inferred number of gains and losses, respectively. (B) Gain/loss ratio of protein domain diversity in selected ancestors, including animals (upper chart; from Metazoa to Unikonta/Amorphea) and unicellular holozoans (lower). Heatmap to the right represents the log-ratio value of the diversification rate for selected sub-sets of functionally-related protein domains relevant to multicellularity: green indicates higher-than-average diversification; pink less; white asterisks indicate two-fold or more increases or decreases (all comparisons relative to the whole set of protein domains). Source Data Figure 7—source data 1, 2, 3 and 4. We assessed the frequency of protein domain rearrangements by quantifying the rates of domain pair gain and loss at each node of the eukaryotic tree (number of gained or lost domain pairs relative to the total number of pairs in that node) (Figure 7A–B). 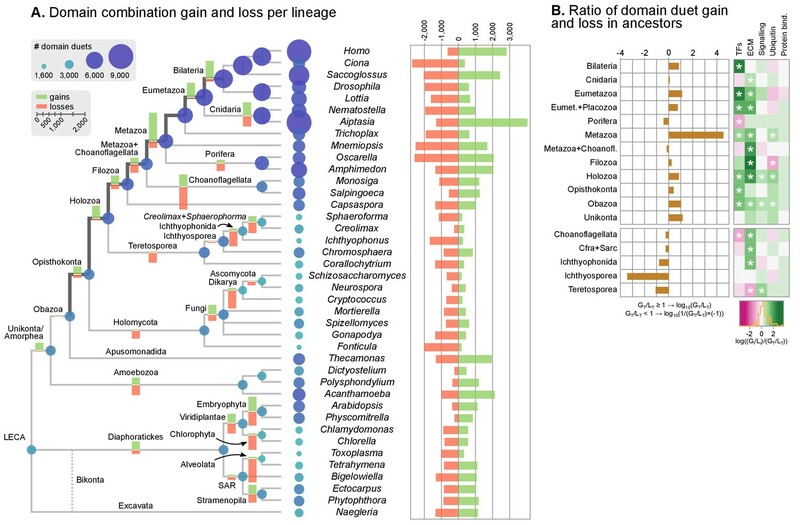 Gains and losses are frequent but unequally distributed across organisms and over time, with a majority of nodes showing a tendency towards destruction or creation of domain combinations. Out of 73 analyzed organisms, 20 show a strong bias towards gains, 32 a bias towards losses (>5% difference in either sense), and 64 show combined rates of gain and loss of >10% (Figure 7A). In contrast, the ancestral reconstruction of individual protein domain evolution (based on Dollo parsimony) showed that losses dominate in most nodes, both extant and ancestral – with the exception of animals and their ancestors (Figure 7—figure supplement 1) (Zmasek and Godzik, 2011). In this scenario of pervasive domain rearrangements, we identified a consistent pattern of creation of protein domain architectures in the lineage leading to Metazoa – specifically, the line of descent from the opisthokont to the bilaterian LCA (Figure 7A–B). This tendency was most acute at three points in animal prehistory: the Holozoa LCA, the Filozoa LCA (Capsaspora, animals and choanoflagellates) and the Metazoa LCA. Conversely, unicellular holozoans outside the animal lineage were dominated by secondary simplification (e.g., the LCAs of choanoflagellates or ichthyosporeans, as well as some individual species such as Sphaeroforma, Ichthyophonus or Corallochytrium) or by dynamic stasis (e.g., Capsaspora, Creolimax or Chromosphaera). Our analysis thus shows that the increased diversity of protein organizations in animals has its roots in successive events of domain shuffling during their unicellular holozoan prehistory, even if this period was dominated by a relative stasis in terms of the emergence of new protein domain families (Figure 7A and Figure 7—figure supplement 1). Then, we questioned whether these expansions were more frequent in protein domains related to typical multicellular functions, such as the extracellular matrix (ECM), transcription factors (TF) or signaling pathways (Suga et al., 2013; Richter and King, 2013; de Mendoza et al., 2013; Hynes, 2012; de Mendoza et al., 2014). We found that gene families carrying TF- and ECM-related domains had consistently higher diversification rates not only in Metazoa but also in their unicellular ancestors (Figure 7B, right panel; asterisks indicate two-fold differences). We thus identify a continuous process of protein diversity gain involving multicellularity-related genes in animal ancestors ranging from the LCA of Obazoa (Opisthokonta + Apusomonadida) to the LCA of Metazoa. Next, we analyzed the dynamics of the bursts of innovation in protein domain architectures in the unicellular ancestry of Metazoa, particularly regarding TFs and ECM-related genes. Specifically, we examined the degree of protein domain promiscuity across gene families (i.e., whether a specific domain combination is re-used in multiple gene families) in different ancestors, to measure changes in the specificity of protein domain architecture diversity. We measured domain promiscuity by modeling each proteome as a network graph, where vertices represented protein domains that were linked by edges if they co-occurred in a given gene family (with ≥90% probability for the ancestral reconstructions; Methods and Figure 8). In this context, highly promiscuous domains would join multiple gene families within the network, whereas gene family-specific domains would form independent clusters. This effect can be investigated by computing the network modularity: a parameter describing the degree of isolation of 'modules' (here, groups of co-occurring domains) within a network given their connections to other 'modules' (Figure 8C). (A and B) Modularity and community size of the global network of domain pairs (upper panels) and the TF subnetwork (lower panels), with ≥90% probability. The modularity parameter measures the fraction of the intra-community edges in the network, minus the expected value in a random network (takes values from 0 to 1; see Materials and methods and [Newman and Girvan, 2004]). Panels at the left show the observed modularity of the protein domain (sub)networks of various genomes (Holozoa and selected ancestors; dots are taxa-colored). Purple box plots represent the distribution of simulated modularities from 100 rewirings of the original organism-specific networks, while keeping a constant vertex degree distribution. Panels to the right show the relationship between modularities and the number of domains/community, both for actual genomes (orange) and simulated rewired networks (purple density plot, see Methods). Monotonic dependence between modularity and domains/community was tested for each set of data (global, TF and their respective simulations) using Spearman's rank correlation coefficient (ρs), and linear regression fits are included for clarity. Note that simulated TF subnetworks are less modular and have more domains/community than the original ones, signaling their higher-than-expected modularities. Note that the scales of the vertical axes change between upper and lower panels. (C) Example of protein domain co-occurrence network. Vertices represent domains, linked by edges if they co-occur within the same gene family. Two subnetworks are highlighted in yellow (domain pairs occurring in TF genes) or green (same for signaling genes). Figure 7—source data 1 and 2, Figure 1—source data 2. We identified a general tendency for multi-domain protein families to diversify by acquisition of highly promiscuous domains also present in other families. This result was based on two observations. First, network modularities were high in most analyzed genomes (within the 0.7–1 range; consistent with previous observations (Itoh et al., 2007; Xie et al., 2011)) but they were generally lower in animals than in their unicellular relatives and ancestors (Figure 8A). Second, there was a strong negative relationship between modularity and the number of protein domains per gene family (Spearman's rank correlation coefficient, ρs=−0.96, p<0.001, Figure 8B). Therefore, at the genome level, gene family diversification tends to reduce modularity due to the use of highly promiscuous protein domains, as it has been frequently reported in animals (Simakov and Kawashima, 2017; Basu et al., 2008). This same effect was observed when we analyzed subsets of the proteome networks sharing a common function: the diversification of gene families with domains related to the ECM, signaling, ubiquitination or protein–protein interactions occurs by acquisition of promiscuous domains that reduce their modularity (with ρs in the range −0.32 to −0.84 and p<0.001; Figure 8—figure supplement 1A–D), and this reduction is frequently stronger in animals than in their unicellular relatives and ancestors (Figure 8—figure supplement 1E–H). The high promiscuity of domains mediating protein-protein interactions has already been reported in previous analyses (Basu et al., 2008; Zmasek and Godzik, 2012), thus confirming the validity of our approach. However, the analysis of the transcription factor domain sub-networks exhibited an opposite signal: animal TF genes have more exclusive domains than their unicellular ancestors or relatives (reflected by higher modularities; Figure 8A, lower panel). Also, there was no negative relationship between the number of domains per community and the network modularity (ρs=0.12, p-value=0.32), meaning that the addition of new domains to TF genes occurred in a gene family-specific manner (Figure 8B). This implies that the expanded TF repertoires of animal genomes (de Mendoza et al., 2013) preferentially diversify their protein domain architectures by acquiring new, not promiscuous, domains. In summary, we identify a distinct dynamics of protein domain rearrangements for TF families in the LCA of Metazoa: new domains tend to be acquired in a family-specific manner (as opposed to reuse of promiscuous domains), contributing to the functional specialization of the animal TF repertoire. Our ancestral reconstruction of protein domain architectures (Figure 7) allowed us to investigate the evolutionary origin of specific domain organizations within gene families and examine their diversification pattern in the ancestry of animals (Table 1). For example, we recovered many examples of gene family-specific domain diversification in novel animal TFs (Figure 10): Homeobox families (OAR, PBC/X, SIX, CUT, Pou, HNF or PAX families), TALE Homeobox (Homeobox_KN domain; Meis/Knox families), MH (MH1 and MH2 domains), bZIPs (Jun), C4 zinc finger (nuclear hormone receptors), Ets (Ets with modified SAM motifs) and HMG-box (SOX). Interestingly, the functions of accessory domains were often related to regulation of TF multimerisation or the DNA-binding affinities of the protein (de Mendoza et al., 2013; Sebé-Pedrós et al., 2011; Holland et al., 2007; Holland, 2013). These TF families appeared as isolated clusters when we sorted protein domains by their pattern of co-occurrence in the reconstructed Metazoa LCA (Figure 9A). Furthermore, we detected an unexpected premetazoan origin for some TF classes as per their domain combinations (Figure 10). We validated two case-in-point examples by phylogenetic analysis, in order to illustrate the distinct pattern of TF domain diversification: the LIM Homeobox (LIM-HD) and p300/CBP transcriptional coactivators. 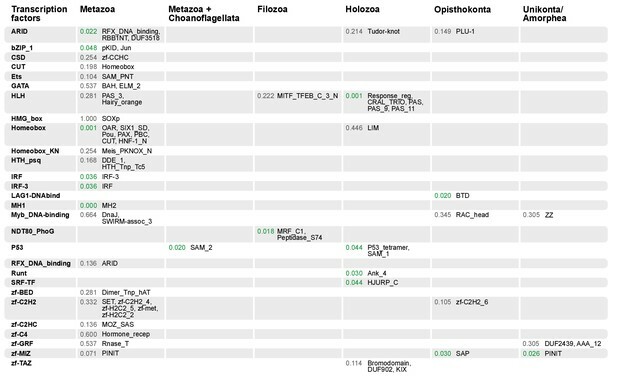 Phylogenetic analysis of the premetazoan gene families LIM Homeobox, CBP/p300 and type IV collagen. (A and B) Protein domain co-occurrence matrices of transcription factor (TF) (A) or extracellular matrix (ECM)-related gene families (B), inferred at the LCA of Metazoa (≥90% probability). Horizontal and vertical axes of the heatmap represent individual protein domains and their mutual co-occurrence frequency, and have been clustered according to the number of shared domains (dendrogram based on Spearman correlation distances and Ward clustering algorithm). Note that, for TFs, most co-occurrence clusters are located along the diagonal, indicating isolated domain communities; whereas ECM genes tend to contain promiscuous domains shared in multiple domain co-occurrence communities. Representative examples of independent and promiscuous domain clusters have been highlighted in both heat maps (orange and pink, respectively). (C) Phylogenetic tree of LIM Homeobox TFs, with mapped protein domains architectures. (D) Phylogenetic tree of CBP/p300 TFs based on HAT/KAT11 domain, with mapped consensus protein domain architectures. (E) Phylogeny of type IV collagen genes based on the C4 domain. All extant homologs, from Ministeria to animals, have a C4-C4 dual arrangement of filozoan origin (reflected in the phylogeny by two parallel clades representing the first and second domains within each gene). Ministeria (orange) and human (blue) homologs are highlighted. In C, D and E panels, bold branches represent unicellular holozoan genes and are color-coded by taxonomic assignment. All trees are Bayesian inferences (BI). Protein domain architectures and statistical supports (BPP/UFBS) are shown for selected nodes (see Figure 9—figure supplement 1 for the complete BI and ML trees with statistical supports). Figure 7—source data 1 and 2. Domain combinations that appear in transcription factor (TF) families in unicellular premetazoans, from the LCA of Unikonta/Amorphea to the LCA of Metazoa. First and second columns indicate the TF family and its inferred evolutionary origin, respectively (from [de Mendoza et al., 2013]). Subsequent columns list (i) the p-value of a Fisher's exact test for the relative enrichment of that TF family in that node of the tree (compared to other domains that rearrange there; p-values<0.05 in green); and (ii) the accessory domains that appear within each TF family. Figure 7—source data 2, Table 1. LIM homeobox genes have been classified as an animal-specific non-TALE family (Srivastava et al., 2010b). However, we identified LIM-associated homeobox genes in multiple ichthyosporeans, Corallochytrium and Capsaspora. We classified these candidate genes according to HomeoDB (Zhong and Holland, 2011) using (Holland et al., 2007) as a phylogenetic reference. Our analysis identified bona fide LIM-HD homologs with 1–2 LIM domains in Corallochytrium, Chromosphaera, Ichthyophonus, Amoebidium and Capsaspora (which had 1–2 LIM domains and a homeodomain); together with many LIM-devoid homologs in Creolimax, Sphaeroforma, Pirum and Abeoforma (Figure 9C). None of the unicellular holozoan LIM-HD genes could be confidently assigned to animal LIM homeodomain subfamilies (Lhx1/5, Lhx3/4, Lmx, Islet, Lhx2/9, Lhx6/8), probably because they emerged before LIM-HD radiation in animals. As such, they also predate the establishment of the LIM code of cell type specification, which has been shown to control neuronal differentiation via combinatorial expression of LIM-HD subfamilies, in animals from Caenorhabditis elegans to mammals or the sea walnut Mnemiopsis (Simmons et al., 2012; Thor et al., 1999; Gadd et al., 2011). Given that transcriptionally regulated cell type specification has already been demonstrated in Creolimax (de Mendoza et al., 2015), the presence of LIM-HD paralogs in ichthyosporeans will require further examination, as it raises the possibility of a conserved or convergent regulatory role in cell differentiation. The p300/CBP TF is a transcriptional activator that contributes to distal enhancer demarcation by histone acetylation in bilaterian animals and Nematostella (Gaiti et al., 2017a). Most eukaryotes have a consensus architecture composed of a central HAT/KAT11 domain (acetylase) flanked by three zinc fingers of TAZ (2) and ZZ (1) types (DNA-binding motifs) (Figure 9D). Animal p300/CBP homologs typically include an additional 3-domain structure, N-terminal to the acetylase domain, composed of KIX-Bromodomain-DUF902. KIX recognizes and binds to CREB in animals (a cAMP-responsibe bZIP TF), and the Bromodomain is responsible for interaction with acetylated histones. We identified this protein domain architecture in both Capsaspora and ichthyosporeans, which also have the CREB gene (Sebé-Pedrós et al., 2011). Intriguingly, Capsaspora’s epigenome contains p300/CBP-specific histone acetylation marks, but its relatively compact genome lacks distal enhancers (Sebé-Pedrós et al., 2016b). Finally, in stark contrast to TF domain-specific diversifications, clusters of co-occurring protein domains in ECM-related genes were dominated by highly promiscuous domains shared between different gene families (Figure 9B). This pattern explains the lower network modularity of animal ECM genes (Figure 8—figure supplement 1). Among the most promiscuous domains, we found epidermal growth factor-related domains (EGF-CA, EGF), type III fibronectin or protein tyrosine kinase motifs, consistent with previous observations (Cromar et al., 2014). These domains are part of multiple, functionally different gene families: structural laminins, immunoglobulins, the Notch/Delta signaling system, LDL receptors or GPCR signaling genes (pink highlight, Figure 9B). The diversification of collagen genes, however, is a counterexample to the promiscuous domain shuffling at the ECM: like many TFs, collagens typically contain repetitive motifs with unique domains conferring functional specificity (Hynes, 2012). This includes, for example, structural fibrillar collagens (COLFI domains and further specialization within metazoans), type XV/XVIII (endostatin/NC10 domains), type IV collagen or type IV-like spongins (specific of invertebrate metazoans); there are also non-structural genes like collectin receptors (Lectin-C) or the C1q complement subcomponent (C1q) (Hynes, 2012; Aouacheria et al., 2006; Heino, 2007; Fahey and Degnan, 2012; Exposito et al., 2008). Most collagen genes appeared and expanded in Metazoa, concomitantly with the ECM structures they associate with (Hynes, 2012; Fidler et al., 2017). We found, however, a remarkable exception: a canonical type IV collagen gene in the filasterean Ministeria vibrans, a naked filose amoeba devoid of basement membrane or ECM (Patterson et al., 1993; Cavalier-Smith and Chao, 2003). Cross-linked type IV collagens are part of the structural core of animal basement membranes (to date, all of its components had been described as exclusive to animals) (Hynes, 2012; Fidler et al., 2017). This Ministeria ortholog is composed of a pair of C4 domains at the C-terminus and multiple collagen Gly-X-Y repeats. Phylogenetic analysis of C4 showed that this domain arrangement appeared from two duplicated motifs within the same protein, and its order is thoroughly conserved in animals and Ministeria (Figure 9E). Thus, a canonical type IV collagen was already present in the common ancestor of filastereans, choanoflagellates and animals – which was unicellular and most likely lacked ECM or basement membrane-like structures. The essential role of collagen IV in the organization of extant metazoans’ tissues (Fidler et al., 2017) would therefore require a co-option from an earlier function in a unicellular context, as it has been previously proposed for other ECM components such as the integrin adhesome (Sebé-Pedrós et al., 2010) or cadherins (Abedin and King, 2008). We have investigated the evolutionary dynamics of key genomic traits in the unicellular ancestry of Metazoa, in the first comparative genomic study that simultaneously includes all unicellular holozoan lineages, and more than one species per lineage: animals, seven Teretosporea genomes (six ichthyosporeans and Corallochytrium), Capsaspora, and two choanoflagellates (Salpingeoca and Monosiga). Our enhanced taxon sampling, including four newly sequenced genomes, allows us to perform both within- and across-lineage comparisons, thus covering the different time scales at which the evolution of coding and non-coding genome features occurred. We have identified continued process of gene innovation in terms of protein domain architectures in the animal ancestry, peaking at the LCA of Holozoa. This burst of diversification, enriched in TFs and ECM-related domains (Figure 7B), set the foundations of the animal-like gene tool-kits of unicellular holozoans that have been reported in previous studies of gene family evolution regarding signaling pathways (Suga et al., 2012; Grau-Bové et al., 2015, 2013), cell adhesion systems (de Mendoza et al., 2015; Nichols et al., 2012; Sebé-Pedrós et al., 2010) and transcription factors, often involved in developmental processes (de Mendoza et al., 2013; Sebé-Pedrós et al., 2011). The expansion of protein diversity in early holozoans provided fertile ground for the frequent co-option of ancestral genes for multicellular functions in Metazoa (Richter and King, 2013). Overall, our probabilistic reconstruction of the genome content of unicellular animal ancestors (available as Figure 7—source data 7) provides a useful framework for targeted analysis of gene evolution and protein domain architecture evolution. As case-in-point examples of our approach, we have established the premetazoan origin of the transcription factors LIM Homeobox (present in Ichthyopsorea and Capsapsora) and p300/CBP-like (all unicellular Holozoa) (Figure 9C–E), and canonical Type IV collagens, a key element of the animal ECM (Hynes, 2012) (present in the filasterean amoeba Ministeria vibrans). We have also investigated the time of origin of intron-rich genomes in Holozoa. We detect three independent episodes of massive intron gain: (1) at the root of Metazoa, (2) the shared LCA between Metazoa and Choanoflagellata, and (3) the root of ichthyophonid Ichthyosporea (Creolimax, Sphaeroforma and Ichthyophonus). Furthermore, since the early origin of introns in the earliest eukaryotes (Irimia and Roy, 2014), the ancestry of both animals and ichthyophonids maintained a state of high intron density. The evolutionary implications of this circumstance, however, remain an open question. First, the independent intron gain episodes of animals and unicellular holozoans are mirrored by two different modes of alternative splicing dominating in each clade: animal transcriptomes are rich in isoform-producing exon skipping (McGuire et al., 2008; Irimia and Roy, 2014), whereas most of the alternatively spliced transcripts of Capsaspora (Sebé-Pedrós et al., 2013) and Creolimax (de Mendoza et al., 2015) originate by intron retention and are thus more similar to the putative ancestral eukaryote than to Metazoa (Irimia and Roy, 2014). Second, we here show that the holozoan LCAs that underwent intron invasions (Ichthyophonida, Metazoa and Metazoa + Choanoflagellata) all possessed the essential NMD machinery and a rich complement of assisting splicing factors (Figure 5C). Thus, they were in principle able to reduce the costs imposed by slightly deleterious intron invasions, as predicted by the mutational-hazard hypothesis (Lynch and Conery, 2003; Lynch, 2002, Lynch, 2006). And third, the protracted state of high intron density in the ancestry of Metazoa and Ichthyophonida could have contributed to maintaining high levels of transcriptome variability that could in turn be co-opted for potentially adaptive, regulated AS events (Irimia and Roy, 2014; Koonin et al., 2013). However, we cannot at present elucidate the relative importance of adaptation and population-genetic effects in the holozoans’ intron gain episodes: further transcriptomic analyses of unicellular holozoans are required to confirm that intron retention is their ancestrally prevalent AS mode (Sebé-Pedrós et al., 2013; Irimia and Roy, 2014; de Mendoza et al., 2015); and the scant data on unicellular holozoans’ population genetics hampers the interpretation of genome architecture evolution under the light of the mutational-hazard hypothesis (Lynch and Conery, 2003; Lynch, 2002). We also addressed the evolution of genome size across holozoans. The emergence of larger genomes in Metazoa cannot be explained solely by intron gain and gene family expansion (Elliott and Gregory, 2015a). Unfortunately, other factors such as the contribution of TE invasions (Figure 3B) or the extension of intron sites are not possible to date at the holozoan-wide evolutionary scale due to the lack of conserved signals. A possible way out of the conundrum is to study the conserved functions in the non-coding parts of the genome. For example, the compact genome of Capsaspora (median intergenic regions: 373 bp) has intragenic cis-regulatory elements key to its temporal regulation of cell differentiation (Sebé-Pedrós et al., 2016b), but the putative regulatory functions in the larger intergenic regions of Creolimax, Sphaeroforma and Salpingoeca (median intergenic 900–1200 bp) remain uncharacterized. It is tantalizing to note that (1) Creolimax and Salpingoeca exhibit temporal differentiation of cell types (Fairclough et al., 2013; de Mendoza et al., 2015), and (2) their intergenic median sizes are in line with those of Amphimedon (885 bp) (Figure 1—source data 1), a demosponge with bilaterian-like promoters and enhancers, including distal regulation (Gaiti et al., 2017a, Gaiti et al., 2017b). However, the ancestral gene linkages conserved across Metazoa, frequently due to common cis-regulation (Irimia et al., 2012), appear to be animal innovations absent in unicellular holozoans (Figure 3—figure supplement 1). We thus propose that homologous regulatory regions would be rarely conserved between animals and unicellular holozoans; and only common types of regulatory elements could be expected, e.g. distal enhancers or developmental promoters. Overall, our results show that extant holozoan genomes have been shaped by both differential retention of ancestral states and secondary innovations, for the multiple genomic traits analyzed here, namely genome size, intron density, synteny conservation, protein domain diversity and gene content (reviewed in (Richter and King, 2013)). We can thus conclude that the genomes of unicellular premetazoans were shaped by independent evolutionary pressures on different traits, as has been seen in Metazoa (Simakov and Kawashima, 2017). Our findings can help to delimit the implicit trade-offs of choosing a unicellular model organism for functional and comparative studies with Metazoa, taking into account the loss of animal-like genomic traits relevant to different analyses. For example, phylogenetic distances between orthologous genes are shorter between some ichthyosporeans and animals than between choanoflagellates and animals (Figure 3D), yet choanoflagellates are more similar to the animal ancestor in terms of intron structure (Figure 6A) and have lower rates of protein domain diversity loss (Figure 7B). Interestingly, Capsaspora emerges as a well-suited model with a slow pace of genomic change attested for multiple traits: intron evolution, coding sequence conservation, gene order and (possibly) genome size. Its remarkable microsynteny conservation with Corallochytrium and Chromosphaera indicates the existence of ancestral holozoan gene linkages that have been disrupted, and rewired, in extant choanoflagellates, ichthyosporeans and animals (Figure 3C). However, Capsaspora's lack of close sister groups hampers comparative studies of faster-evolving genomic features, be it the regulatory circuitry (Sebé-Pedrós et al., 2016b), or co-option of genetic tool-kits for its unique aggregative development (Sebé-Pedrós et al., 2013). The new genomes from Ichthyosporea and Corallochytrium analyzed here provide novel insights into the reconstruction of premetazoan genomes. The Teretosporea clade has a deeper sampling than other unicellular holozoans and exhibit a mixture of slow- and fast-evolving genomic traits, which provides novel insights into the independence of genomic characters during premetazoan evolution. For example, Ichthyophonus tends to retain the ancestral intron/exon structure (Figure 6A) and is relatively similar to animals in terms of coding sequence conservation (Figure 3D), but it harbors a secondarily expanded genome with disrupted gene linkage (Figure 3A,C). Another example is Corallochytrium and Chromosphaera, both with massive simplifications of intron content (Figure 5A), but higher synteny conservation with the inferred ancestral Holozoa (Figure 3C). Also, the diversity of protein domain combinations of Chromosphaera is the highest among ichthyosporeans (in line with values of animals and holozoan ancestors; Figure 7A) and phylogenetic distances to animal orthologs are comparatively low (Figure 3D). These studies of genome history in holozoans are key to our interpretation of functional genomics analyses. For example, Creolimax and Sphaeroforma are close species with a broadly conserved life cycle (Glockling et al., 2013), and they could therefore be an apt model to test hypotheses of cell type evolution in Holozoa – for example, whether new cell types emerge as lineage-specific transcriptomic specializations, as proposed by (de Mendoza et al., 2015). This investigation would benefit from taking into account their high microsynteny when analyzing co-regulated gene modules, while considering that Sphaeroforma’s multiple TE invasions could blur the conservation of non-coding regulatory elements in the intergenic regions (Figure 3A–C). 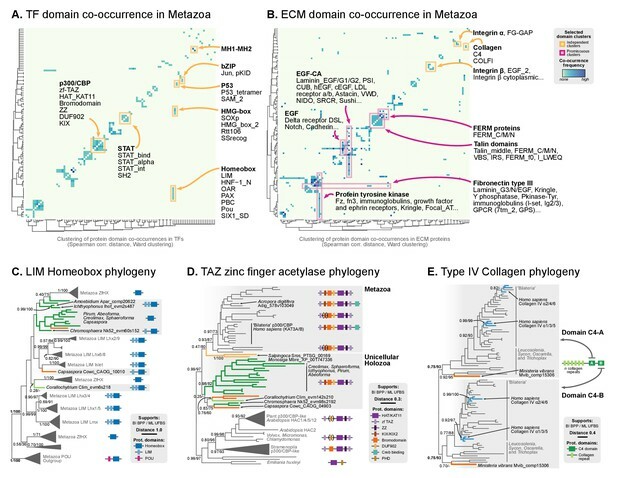 Our analysis of ten unicellular holozoans has uncovered the timing of genome evolution in the ancestry of Metazoa, at both the architectural and gene content levels. In particular, we have observed that holozoan genomes evolved under temporally uncoupled dynamics for synteny reorganization, intron gains, TE propagation, coding sequence conservation and gene family diversification. Some of these traits have independent effects in extant holozoans, e.g., different episodes of intron gain or genome expansion in ichthyosporeans and animals. 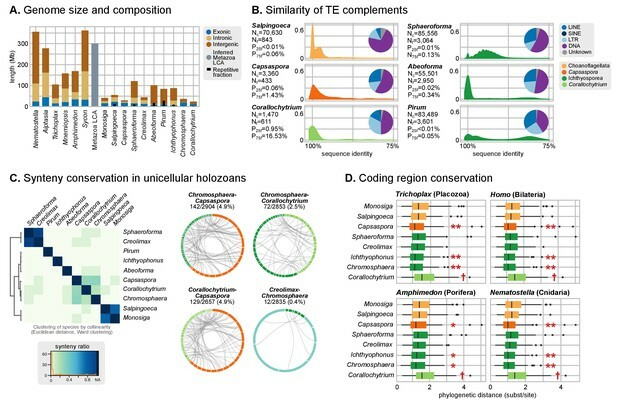 Yet, other traits exhibit conserved dynamics across the unicellularity/multicellularity divide: the diversification of ECM and TF gene families—including molecular tool-kits essential for multicellularity—extends back to the LCA of Holozoa; and the high intron densities in premetazoans suggest a continued state of transcriptome variability, co-optable for regulation or protein innovation, in the unicellular prehistory of Metazoa. Overall, our timeline of holozoan genome evolution offers a framework to investigate when and how premetazoan genomic elements—gene tool-kits, linkages and structure, and the non-coding sequences that harbor epigenomic regulatory elements—were functionally co-opted in multicellular animals. Corallochytrium limacisporum, Abeoforma whisleri and Pirum gemmata were grown in axenic culture in marine broth medium (Difco 2216) at 18°C (Abeoforma and Pirum) or 23°C (Corallochytrium). Chromosphaera was grown in axenic culture at 18°C in YM medium (containing 3 g yeast extract, 3 g malt extract, 5 g bacto peptone, 10 g dextrose, 14.5 g Difco agar, and 25 g sodium chloride, per liter of distilled water). DNA-seq data was produced for Pirum, Abeoforma, Chromosphaera and Corallochytrium, by sequencing paired-end (PE) and Nextera mate-pair (MP) libraries. DNA extractions were performed from confluent axenic cultures, grown in three flasks of 25 ml for 5 days. DNA was extracted using a standard protocol by which cells were lysed in the extraction buffer composed of Tris-HCL, 50 mM EDTA, 500 mM NaCl and 10 mM ß-mercaptoethanol. DNA was purified with phenol:chloroform:isoamyl alcohol (25:24:1) and treated with of Rnase A (Sigma Aldrich, Saint Louis, MO, USA). For each library, the read numbers, lengths and insert/fragment sizes were as follows: Pirum, PE 125 bp (250·106 reads, 250 bp insert size), MP 50 bp (108·106 reads, 6 kb fragment size); Abeoforma, PE 100 bp (73·106 reads, 600 bp insert size), MP 100 bp (41·106 reads, 6 kb fragment size); Chromosphaera, PE 125 bp (143·106 reads, 250 bp insert size), MP 50 bp (114·106 reads, 5 kb fragment size); and Corallochytrium, PE 100 bp (150·106 reads, 420 bp insert size), MP 100 bp (47·106 reads, 3 kb fragment size). All PE and MP libraries were prepared and sequenced at the CRG Genomics Unit (Barcelona), using Illumina HiSeq 2000 and the Trueseq Sequencing Kit v3 (Abeoforma and Corallochytrium) or v4 (Pirum and Chromosphaera). The only exception was Corallochytrium PE libraries, which were sequenced at the Earlham Institute Genomics Unit (Norwich, UK) using Illumina MiSeq and the Trueseq protocol v2. Genome sequencing data has been deposited in NCBI SRA under the BioProject accession PRJNA360047. RNA-seq data was produced for Chromosphaera and Abeoforma. RNA extractions were performed from confluent axenic cultures grown in three 25 ml flasks for 5 days. RNA was extracted using Trizol reagent (Life Technologies, Carlsbad, CA, USA) with a further step of Dnase I (Roche) to avoid contamination by genomic DNA, then purified using RNeasy columns (Qiagen). We sequenced PE libraries of 125 bp with an insert size of 250 bp, yielding 168·106 reads for Chromosphaera and 178·106 for Abeooforma; which were constructed using the Trueseq Sequencing Kit v4 (Illumina, San Diego, CA). The libraries were sequenced in one lane of an Illumina HiSeq 2000 at the CRG genomics unit (Barcelona). All transcriptome sequencing data has been deposited in NCBI SRA using the BioProject accession PRJNA360056. Genomic PE and MP libraries were quality-checked using FastQC v0.11.2 (Andrews, 2014) and trimmed accordingly with Trimmomatic v0.33 (Bolger et al., 2014) to remove remnant adapter sequences (ad hoc) and the low-quality 5' read ends (sliding window = 4 and requiring a minimum Phred quality = 30). A minimum length equal to the original read length was required. During the quality-trimming process, libraries of unpaired forward reads were kept as single-end reads (SE). After trimming, the read survival rate for each DNA library was as follows: Pirum, PE 30.2%, MP 91.2%; Abeoforma, PE 75.5%, MP 31.0%; Chromosphaera, PE 81.1%, MP 89.9%; and Corallochytrium, PE 94.7%, MP 73.1%. Genome assemblies were performed using Spades v3.6.2 (Nurk et al., 2013) with the BayesHammer error correction algorithm (Nikolenko et al., 2013). For each organism, PE data were analyzed using Kmergenie (Chikhi and Medvedev, 2014) to determine the optimal k-mer length for the assembly process, which was used in the Spades assembly in combination with smaller and larger values, including the maximum possible odd length below the maximum read length after trimming. The optimized assemble parameters for each genome were as follows: Pirum, max. read length = 125, k = 55,123; Abeoforma, max. read length = 100, k = 47,91; Chromosphaera, max. read length = 125, k = 91,121; Corallochytrium, max. read length = 100, k = 41,63,91. In the cases of Corallochytrium and Chromosphaera genomes, Spades was run in careful mode, taking into account PE, SE and MP data in the same run. In the cases of the highly repetitive Abeoforma and Pirum genomes, an initial Spades assembly of PE and SE libraries was combined with MP libraries using the Platanus v1.2.1 scaffolding module (Kajitani et al., 2014). Each assembly was later processed using the GapCloser module from SOAPdenovo assembler with PE data, in order to extend the scaffolded contigs by shortening N stretches (Luo et al., 2012). Genome assembly statistics (genome size, N50, L75) were calculated using Quast v2.3 (Gurevich et al., 2013), and completeness was assessed using the BUSCO v1.1 (Simão et al., 2015) database of universal eukaryotic genes, based on the predicted transcripts. Genome feature annotations were produced for Corallochytrium, Chromosphaera, Abeoforma, Pirum and Ichthyophonus. We used evidence-based gene finders (relying on transcript/peptide mapping: Augustus v3.1 (Keller et al., 2011) and PASA v2.0.2 [Haas et al., 2003, 2008]), plus complementary ab initio predictors (based on hidden Markov models for gene structure: GeneMark-ES v4.21 (Lomsadze et al., 2005) and SNAP [Korf, 2004]). These results were combined to produce a consolidated gene annotation using Evidence Modeler v1.1.1 (Haas et al., 2008). SNAP and GeneMark-ES annotations were iterated for three times on the final genome assemblies, using the output of each step as a training set for the next one (the first SNAP prediction was done using the standard minimal HMM; GeneMark-ES was omitted for Abeoforma and Pirum due to its highly fragmented gene bodies, which impaired intron delimitation). Transcriptome assemblies were produced to support PASA and Augustus gene predictions. RNA-seq PE libraries were assembled using genome-guided Trinity v2.0.6 and STAR v2.5 (for Corallochytrium, Chromosphaera and Ichthyophonus) or de novo Trinity (Pirum and Abeoforma, assemblies from (Torruella et al., 2015; Grabherr et al., 2011; Dobin and Gingeras, 2015). In the case of the Corallochytrium, Chromosphaera and Ichthyophonus genome-guided assemblies, quality control was performed as indicated above for the genomic libraries, using the RNA-seq data generated for this study (Chromosphaera) or in (Torruella et al., 2015) (Ichthyophonus accession: PRJNA264423; Corallochytrium accession: PRJNA262632). A minimum k-mer coverage = 2 was used in all Trinity assemblies. Transcriptome assemblies were annotated with Transdecoder using Pfam release 29 protein domain database, in order to obtain mRNA and translated peptides. Next, PASA annotations were obtained from assembled transcripts, mapped to the genome using GMAP and BLAT v35 (Kent, 2002; Wu et al., 2016). Only high quality mapping was accepted, with a minimum of 95% identity and 75% transcript coverage. We then trained Augustus independently, using protein and mRNA predictions (mapped to the genome with Scipio 1.4 (Keller et al., 2008), BLAT and GMAP), followed by an optimization round of the species-specific parameters. After the training, an Augustus prediction was performed using the optimized parameters. Finally, all annotations were consolidated using Evidence Modeler. In this step, gene models from PASA and Augustus were given higher relative weights than ab initio-predicted models (10 and 5 times more reliability, respectively). We used an improved version of the dataset published by Torruella et al. (Torruella et al., 2015), adding nine single-copy protein domains to the previous version (which included 78 alignments) according to the methodology developed in (Torruella et al., 2012). Since Abeoforma and Pirum genome assemblies were fragmented and contained partial gene models, we used transcriptome assemblies from (Torruella et al., 2015) instead. We compiled a 57-taxa dataset of Unikonta/Amorphea species (hereby termed BVD57 taxa matrix; including Holozoa, Holomycota, Breviatea, Apusomonadida and Amoebozoa; 24,021 amino acid positions). This dataset represents a ~ 10% increase in the number of aligned positions, compared to the original S70 dataset from (Torruella et al., 2015). We used the BVD57 dataset to build ML phylogenetic trees using IQ-TREE v1.5.1 (Nguyen et al., 2015), under the LG model with a 7-categories free-rate distribution, and a frequency mixture model with 60 frequency component profiles based on CAT (LG + R7+C60) (Quang et al., 2008). LG + R7 was selected as the best-fitting model according to the IQ-TREE TESTNEW algorithm as per the Bayesian information criterion (BIC), and the C60 CAT approximation was added because of its higher rate of true topology inference (Quang et al., 2008). Statistical supports were drawn from 1000 ultrafast bootstrap values with a 0.99 minimum correlation as convergence criterion (Minh et al., 2013) and 1000 replicates of the SH-like approximate likelihood ratio test (Guindon et al., 2010), for all models stated above. Furthermore, 500 non-parametric bootstrap replicates were computed for the LG + R7+PMSF CAT approximation (as this was the only CAT approximation for which non-parametric bootstraps could be calculated in a feasible computation time). We then used the same alignment to build a Bayesian inference tree with Phylobayes MPI v1.5 (Lartillot et al., 2013), using the LG exchange rate matrix with a 7-categories gamma distribution and the non-parametric CAT model (Lartillot and Philippe, 2004) (LG+Γ7 + CAT). A Γ7 distribution was considered to be the closest approximation to the free-rates R7 distribution of the IQ-TREE ML analysis (as free-rates distributions are not implemented in Phylobayes). We removed constant sites to reduce computation time. We ran two independent chains for 1231 generations until convergence was achieved (maximum discrepancy <0.1) with a burn-in value of 32% (381 trees). The adequate burn-in value was selected by sequentially increasing the number of burn-in trees, until we achieved (1) a minimum value of the maximum discrepancy statistic, and (2) the highest possible effective size for the log-likelihood parameter. The bpcomp analysis of the sampled trees yielded a maximum discrepancy = 0.095 and a mean discrepancy = 0.001. The tracecomp parameter analysis gave an effective size for the log-likelihood parameter = 37; and the minimum effective size = 11 (for the alpha statistic). Our comparative genomics analyses are based on a dataset of 42 complete eukaryotic genomes, with a focus on unicellular and multicellular Holozoa, and using relevant outgroups from the Holomycota, Apusomonadida, Amoebozoa, Viridiplantae, Stramenopila, Alveolata, Rhizaria and Excavata groups. The complete list of species, abbreviations and data sources is available as Figure 2—source data 1. Since ancestral state reconstruction requires the assumption of an explicit species tree, we classified the 42 genomes in our dataset according to a consensus of phylogenomic studies (Torruella et al., 2015; Derelle et al., 2015; He et al., 2014) and our own results. We remained agnostic about the internal topology of SAR (Burki et al., 2016), Fungi (Torruella et al., 2015), the contentious hypotheses for the root of eukaryotes (namely, ‘Opimoda-Diphoda’ or ‘Excavata-first’) (Derelle et al., 2015; He et al., 2014) and the earliest-branching animal group (Porifera or Ctenophora) (Whelan et al., 2015; Simion et al., 2017). All these cases were recorded in our species tree as polytomic branchings. We inferred two different ortholog datasets using the predicted proteins from the afore-mentioned genomes, using Orthofinder v0.4.0 with a MCL inflation = 2.1 (Emms and Kelly, 2015). The first database included 40 eukaryotic species (excluding the low-quality gene models of Pirum and Abeoforma), whose genes were classified in 162,559 clusters of orthologs, 26,377 of which contained >1 gene (henceforth, ‘orthocluster’). The second database included all available unicellular holozoan genomes (i.e., six ichthyosporeans, two choanoflagellates, Corallochytrium and Capsaspora) and yielded 58,516 orthoclusters, 11,925 of which contained >1 gene. Retrieval of homologous protein sequences was performed by querying orthologs or protein domain HMM profiles (depending on the gene family; see below) against a database of protein sequences from 69 selected eukaryotic genomes and transcriptomes (Figure 2—source data 1). Since Abeoforma and Pirum genome assemblies were fragmented and contained broken gene models, we used transcriptome assemblies from (Torruella et al., 2015) instead. The following gene families were defined by its catalytic/representative protein domain: type IV collagen (PF01413), TAZ zinc finger TFs with HAT/KAT11 domains (PF08214), Upf1 (PF09416), Upf2 (PF04050), Upf3 (PF03467), Smg1 (PF15785), Smg8/9 (PF10220), eRF1 (combination of PF03463 +PF03464+PF03465), Y14 (PF09282), Magoh (PF02792) and MLN51/CASC3 (PF09405). Homologs were thus retrieved by querying Pfam protein domains (29th Pfam release (Punta et al., 2012)), using HMMER v3.1b2 (HMMER, 2015) searches with hmmersearch, using the profile-specific gathering threshold cut-off. In the case of LIM homeodomain genes, we queried the genomes/transcriptomes of all available unicellular holozoans (see taxon sampling above) using the homeobox HMM (PF00046), and restricted the subsequent phylogenetic analysis (see below) to sequences that clustered with known LIM-HD genes from the HomeoDB database in blastp searches (Zhong and Holland, 2011). In the case of the eRF3, eIF4A3, Smg5/6/7 and SRSF1-9 gene families, we queried the genomes/transcriptomes mentioned above using blastp searches of the human orthologs of these gene families (Uniprot accession numbers: eRF3 is P15170; eIF4A3 is P38919; Smg5/6/7 are Q9UPR3/Q86US8/Q92540; SRSF1-9/TRA2 (Plass et al., 2008) are Q07955, Q01130, P84103, Q08170, Q13243, Q13247, Q16629, Q9BRL6, Q13242 and P62995). For eRF3 and eIF4A3 searches, we also included a selection of orthologs from the nearest outgroup gene families: EF1-alpha and HBS1L genes for eRF3 (human accessions: Q05639/P68104 and Q9Y450); and eIF4A1/2 for eIF4A3e (human accessions: P60842/Q14240). Protein alignments were built with MAFFT v7.245 (Katoh and Standley, 2013), using the G-INS-i algorithm optimized for global homology for single-domain alignments (LIM homeobox, type IV collagen, CBP/p300 and SRSF1-9/TRA2) or the E-INS-i for multiple local homology for whole-protein alignments (Smg5/6/7, eIF4A3 and eRF3). All alignments were run for up to 10⁶ cycles of iterative refinement. Then, the resulting alignments were manually examined, curated and trimmed (a process that included the removal of non-homologous amino acid positions and, eventually, non-essential sequences containing too few aligned positions that could disrupt the subsequent phylogenetic analysis). If necessary, the alignment and trimming process was repeated to incorporate the changes from manual curation. Phylogenetic analyses were performed in the final, trimmed alignments using two independent approaches: maximum likelihood using IQ-TREE v1.5.1 (Nguyen et al., 2015) and Bayesian inference using MrBayes v3.2.6 (except in the case of SRSF1-9/TRA2, in which Bayesian inference it was omitted due to the large number of retrieved sequences) (Ronquist and Huelsenbeck, 2003). The optimal evolutionary models for each alignment were selected using ProtTest v3.4’s BIC criterion (Darriba et al., 2011), yielding LG+Γ4 + i as the best model for the Collagen IV, HAT/KAT11, LIM Homeobox, eRF3 and eIF4A3 phylogenies; LG+Γ4 for SRSF1-9/TRA2; and LG+Γ4 + F + i for Smg5/6/7. For IQ-TREE (Nguyen et al., 2015) analyses, the best-scoring ML tree was searched for up to 100 iterations, starting from 100 initial parsimonious trees; statistical supports for the bipartitions were drawn from 1000 ultra-fast bootstrap (Minh et al., 2013) replicates with a 0.99 minimum correlation as convergence criterion, and 1000 replicates of the SH-like approximate likelihood ratio test. For MrBayes analyses, we ran two independent runs of four chains each (three cold, one heated) for a variable number of generations until run convergence was achieved (at different values depending on the gene family), sampling every 100 steps and running a diagnostic convergence analysis every 1000 steps. Convergence was deemed to occur when, using a 25% relative burn-in value, the average standard deviation of split frequencies was <0.01. Final number of generations for each gene family: 7.2·107 generations for Collagen IV; 1.2·107 for LIM Homeobox; and 9.9·106 for HAT/KAT11; 6.4·107 for Smg5/6/7; 1.6·107 for eRF3; 7·106 for eIF4A3. The following gene families, part of the NMD machinery, are unambiguously defined by the presence of their defining protein domains (see above): Upf1, Upf2, Upf3, Smg1, Smg8/9, eRF1, Y14, Magoh and MLN51. Thus, presence of the protein domain in a given species was used to establish the presence of the corresponding ortholog. Repetitive regions were annotated in Holozoa genomes using RepeatMasker open-4.0.5 (Smit et al., 2015) and annotations from the 20150807 release of GIRI RepBase database (Bao et al., 2015). We used the Eukaryota-specific database, with either the slow high-sensitivity search mode (unicellular holozoans) or the default search mode (metazoans); and stored the genome coordinates of TEs, low complexity repeats, tRNA genes, simple repeats and satellite regions. Internal similarity of each genome's TE complements was analyzed with blastn self-alignments of all TEs (considering a minimum 70% identity and 80 bp alignment length), and the distribution of percentage identity values was plotted using R.
where c denotes the number of syntenic orthologs between i and j; s is the number of spurious syntenic orthologs averaged over 100 random replicates; and N is the number of comparable ortholog pairs between i and j. Values are normalized to the 0–1 interval using the maximum values of the dataset as a reference, i.e. Sphaeroforma and Creolimax. A heatmap representing the degree of similarity in pairwise species comparisons was produced using the synteny ratio (R gplots library (Warnes et al., 2016)). Species were clustered according to their mean synteny. The same analysis was performed using the database of 40 eukaryotic genomes, which excluded Abeoforma and Pirum. In this case, the maximum values used as a reference were the Nematostella-Aiptasia pair. For specific selected species comparisons, syntenic pairs were plotted onto the genome scaffolds using Circos v0.67 (Krzywinski et al., 2009). From our ortholog database using 40 eukaryotic genomes (excluding Pirum and Abeoforma, which had lower-quality gene annotations due to their fragmented assemblies), we selected 143 orthoclusters present in all unicellular holozoans, plus Amphimedon queenslandica, Trichoplax adhaerens, Homo sapiens and Nematostella vectensis (as representative animal genomes). We aligned each group of orthologs using MAFFT G-INS-i (Katoh and Standley, 2013), trimmed the alignments using trimAL automated algorithm (Capella-Gutiérrez et al., 2009), and inferred maximum likelihood trees for each ortholog group using RAxML v8.2.0 (Stamatakis, 2014) and the LG amino acid substitution model. Then, for each tree, we recorded all pairwise phylogenetic distances between species as measured by substitutions per alignment position using the cophenetic module of the ape v3.5 R library (Paradis et al., 2004; Core Team, 2015). We retrieved distances between each unicellular holozoan ortholog and, separately, Amphimedon, Trichoplax, Homo and Nematostella orthologs. For each inter-species comparison, we tested the significance of differences in phylogenetic distances between unicellular holozoans, using the non-parametric Wilcoxon rank sum test from the R stats library (Core Team, 2015). Intron content of a subset of 40 eukaryotic genomes (excluding Abeoforma and Pirum, which had lower-quality gene annotations due to their fragmented assemblies) was analyzed using a set of single-copy orthologous genes, and used to reconstruct ancestral states as described by Csűrös et al. (Csuros et al., 2011; Csurös et al., 2007, Csurös et al., 2008). We then selected orthocluster present as single-copies in 80% of our species dataset, allowing for paralog genes to occur in just one species per group (if that was the case, the best-scoring copy in BLAST alignments was kept). This yielded a group of 342 nearly paneukaryotic genes, whose protein translations were then aligned using MAFFT v7.245 G-INS-i algorithm (Katoh and Standley, 2013) and annotated with their intron coordinates (retrieved from their respective genome annotations). With this information, we reconstructed the ancestral states of each intron using the Malin implementation of the probabilistic model of intron evolution developed by Csűrös et al. (Csűrös and Miklós, 2006; Csurös, 2008), starting from the standard null model, running 1000 optimization rounds (likelihood convergence threshold = 0.001) and assuming a consensus eukaryotic phylogeny (see Generation of a species tree for comparative analyses). Conserved intron sites (defined as unambiguously aligned in 80% of the orthologs, maximum of 10% of gap positions) were used to calculate the rates of intron loss and gain for each node of the tree. These rates were used to calculate a table of intron sites with a certain probability of presence, gain or loss at every node of the tree (which, when summed, give the number of introns that are present, gained or lost at that node (Csűrös and Miklós, 2006)). We computed 100 bootstrap replicates in Malin to assess uncertainty about inferred rate parameters and evolutionary history. In particular, we calculated the variance-to-mean ratio of the inferred number of introns in each ancestor with 100 bootstrap replicates (with values higher than one indicating more dispersed results and less reliable inferences). We represented the presence and absence of intron sites at each lineage (extant and ancestral), and the number of introns shared between species (only extant), using heatmaps (R gplots library (Warnes et al., 2016)). Inter-species distances were calculated using the pairwise counts of shared introns and the Spearman correlation algorithm, which was used to perform Ward hierarchical clustering as implemented in R stats library (Core Team, 2015). We used the same algorithms to calculate distances of intron presence probability profiles, and subsequent clustering. For Capsaspora, the phylostratigraphy of intron sites was combined with the nucleosome-free sites identified by ATAC-seq analysis in (Sebé-Pedrós et al., 2016b), which were assumed to be putative regulatory sites. 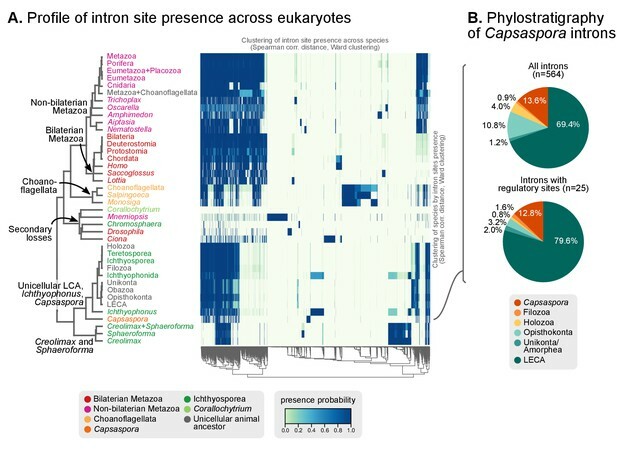 Then, we compared phylostrata distribution ('ancestral' versus 'recent' Capsaspora-specific sites) for introns with and without regulatory sites, using a Fisher's exact test: 74 recent introns and 465 ancestral introns lacked putative regulatory sites (≥50% ATAC site overlap with the intron sequence, calculated using bedtools v2.24.0 intersect utility (Quinlan and Hall, 2010)), while 3 and 22 recent and ancestral introns had regulatory sites. Protein domain architectures of the 40 eukaryotic species subset (excluding Abeoforma and Pirum, which had lower-quality gene annotations due to their fragmented assemblies) were computed using Pfamscan and the 29th release of the Pfam database (Punta et al., 2012). For each protein, the domain architecture was decomposed into all possible directed binary domain pairs (ignoring repeated consecutive domains; i.e. from protein A-B-B-C, the pairs A-B, A-C and B-C were built), and linked to its presence in its corresponding orthocluster (see Generation of a species tree and ortholog datasets for comparative analyses section). The final output was a numerical profile of species distribution for each combination of domain pairs in orthoclusters (considering that a cluster can contain more than one pair, and a pair can be present in more than one cluster, and thence the number of occurrences is recorded). The numerical profile was analyzed using the general phylogenetic birth-and-death model developed by Csűrös and Miklós (Csűrös and Miklós, 2006) as implemented in Count (Csurös, 2010). This allows the comparative analysis and ancestral reconstruction of discretized quantitative properties of genomes, assuming a specific species tree (see Comparative analysis of intron content). We used a gain-loss-duplication model with unconstrained gain/loss and duplication/loss ratios in all lineages, assuming a Poisson distribution of orthocluster size at the LECA (root) and no rate variation categories. In this context, 'gain' was defined as the acquisition of a new pairwise domain combination in an orthocluster; a 'duplication' as the propagation of the combination (by gene duplication or convergent domain rearrangements); and 'loss' as pair dissociation. Starting from the standard null model, we ran 100 optimization rounds (convergence threshold = 0.1). To analyze the modularity of the protein domain networks (and subnetworks) for each genome, we 1) calculated the community structure of each network using Louvain iterative clustering to obtain communities of domain pairs (undirected graphs), and 2) calculated the global network modularity according to these communities. The modularity parameter measures the fraction within-community edges minus the expected value obtained from a network with the same communities but random vertex connections (Newman and Girvan, 2004). A maximum value of 1 indicates a strong community structure, while a minimum value of 0 indicates that within-community edges are as frequent as expected in a random network. For these analyses we used the relevant algorithms from the igraph R library v1.0.1 (Core Team, 2015; Csárdi and Nepusz, 2006). Function-oriented domain subnetworks were obtained by retrieving orthologous groups that contained relevant domains, which were obtained from previous studies (transcription factors from (de Mendoza et al., 2013; Weirauch and Hughes, 2011), signaling domains from (Richter and King, 2013), ECM-related domains from (Richter and King, 2013; Sebé-Pedrós et al., 2010; Hynes, 2012), ubiquitination from (Grau-Bové et al., 2015)) and pfam2go annotations (for the subsets mentioned above, and also for protein-binding domains) (Mitchell et al., 2015). Monotonic statistical dependence between modularity and the number of domains per community was tested using Spearman's rank correlation coefficient (ρs) for all network or subnetwork (for original and simulated data). We mapped the presence of individual protein domains across our dataset of 40 eukaryotic species (excluding Abeoforma and Pirum), as predicted by Pfamscan and the 29th release of the Pfam database (Punta et al., 2012). Using this numerical profile of domain presence in extant genomes, we computed the gains and losses at ancestral nodes using the Dollo parsimony algorithm as implemented in Count (Csurös, 2010). Genome sequencing and assembly data from Corallochytrium, Abeoforma, Pirum and Chromosphaera has been deposited in NCBI using the BioProject accession PRJNA360047. Transcriptome sequencing data from Abeoforma and Chromosphaera has been deposited in NCBI using the BioProject accession PRJNA360056. Proceedings of the Royal Society B: Biological Sciences 283:20152802. Philosophical Transactions of the Royal Society B: Biological Sciences 372:20150474. Genome Biology and Evolution 6:949–963. Molecular Biology and Evolution 22:1053–1066. Molecular Biology and Evolution 25:903–911. In: A Apostolico, C Guerra, S Istrail, P. A Pevzner, M Waterman, editors. Research in Computational Molecular Biology. Venice: Springer. pp. 206–220. Molecular Biology and Evolution 30:802–805. Progress in Biophysics and Molecular Biology 102:1–15. Current Protocols in Bioinformatics 51:11.14.1-19. Philosophical Transactions of the Royal Society B: Biological Sciences 370:20140331. Journal of Biological Chemistry 283:28226–28235. Frontiers in Ecology and Evolution 4:1–13. Journal of Biological Chemistry 286:42971–42980. Molecular Biology and Evolution 32:726–739. Annual Review of Genetics 49:339–366. Advances in Experimental Medicine and Biology 623:190–211. Molecular Biology and Evolution 21:1095–1109. Molecular Biology and Evolution 23:450–468. Molecular Biology and Evolution 27:2014–2026. BMC Genomics 14 Suppl 1:S7–11. Lect. Notes Comput Sci 7821:158–170. Journal of the Marine Biological Association of the United Kingdom 73:67. Gplots: various R programming tools for Plotting Data, https://CRAN.R-project.org/package=gplots. T. R Hughes, editors. Dordrecht: Springer. Thank you for submitting your article "Dynamics of genomic innovation in the unicellular ancestry of animals" for consideration by eLife. Your article has been reviewed by two peer reviewers, and the evaluation has been overseen by Diethard Tautz as the Senior Editor and Reviewing Editor. This is a useful, thorough, and well executed study to examine evolutionary origins of multicellularity in metazoa genome sampling of sister groups to the Metazoa (protists from the Holozoa clade – three Ichthyosporea and Corallochytrium limacisporum). The authors are inferring likely ancestral states of gene/genome characteristics that predated the emergence of multicellularity to highlight the changes that occurred with or enabled these traits. Some interpretation of how Metazoa complexity arose is possible with this dataset and the authors use these comparative analyses to provide some ideas about processes and consequences of these changes. The Corallochytrium genome sequence is the most important contribution of this work to the data sets of eukaryotic genomes, as this lineage remained untouched by genomics as well as basically any other studies. Very little is known about this coral symbiont or parasite or commensal and more analysis of this genome in order to find out more about the biology of this organism would have been interesting, but the current paper focuses on the comparative analyses. This has been done very carefully and it is presented on 37 graphs and tables. The data are analysed very thoroughly and in sophisticated ways. 1) Given this huge amount of detailed information, it appears that the major take home message gets a bit lost. The Abstract suggests that "genome architecture evolution was equally dynamic [as gene evolution]: an early burst of gene diversity in the holozoan ancestor was followed by independent episodes of synteny disruption, intron gain, and genome expansions in both unicellular and multicellular lineages." But some discussion would be required whether the same picture would be seen in many other eukaryotic groups. A better focus on features in the genome evolution which could play a role in evolution of animal multicellularity would be warranted. If the authors do not see any, they should say it clearly as well because this is also a relevant finding. 2) The discussion of the intronization events – these can be interpreted as to how the change in gene structure and the timing of these changes relate, but this can also be interpreted as neutral processes due to changes in effective population size. Is there an adaptive interpretation which is hinted at, given the utility of introns as enabling alternative splicing? Please clarify. 3) The use of Regulated Unproductive Splicing and Translation through Nonsense Mediated Decay and "poison cassettes" (e.g. Lareau et al. Nature 2007, Lareau & Brenner MBE 2015) has been shown to have originated perhaps in the Opisthokont ancestor – is there any information about how the different intronization events could have been driven by differential NMD evolution? Are the splicing factors and NMD machinery present in these Holozoa? 4) Was there any signal in the protein domain network generation of and evidence of more promiscuous domains – in terms of enzymatic, structure proteins or any signals that relate to protein-protein interactions changes too? Or is this all fully captured in the graphs? One cannot tell if the types of domains that are playing a role in the changes (seen increasing in 6B – Metazoa) are mostly the classes highlighted at right or if any others come into play – if the authors are taking a candidate family focused approach here but are also able to discover other types of expansions? "The genomes of extant Metazoa are subject to overlapping evolutionary dynamics for different traits" – what makes any of this pre or post-metazoan ancestor specific? All genomes change and why wouldn't we expect these dynamics to be a constant refrain back to the unicellular ancestor? 6) Similarly, the final sentence summarizes the interpretations: "Consequently, we see how the genomes of ancestral premetazoans were subject to the same processes observed in most animal phyla" – it is unclear why we should expect anything different. What aspects of the animal phyla have driven the different processes? effective population size changes? Expansion of cell type or true multicellularity? "and no trait left to tinker with" – this implication is difficult to understand. Why is there nothing left to tinker with? We appreciate the concern regarding the clarity of the message. We have introduced some changes that we believe will help clarify it. First, in order to simplify the Abstract, we now refer exclusively to the “episodes of synteny disruption, intron gain, genome expansions” that occurred, specifically, in the immediate ancestry of Metazoa – which are of interest to a wider readership interested in multicellularity origins. Other reorganizations of the genome occurring in unicellular holozoan groups, which also feature prominently in our results, are then discussed on a per-analysis basis. We have also now more clearly introduced the relationship between ‘genomic complexity’ and multicellularity earlier on in the Introduction section (second paragraph). In the pertinent sections of the Results and Discussion, we further elaborate on some of these issues. For example, we explore the link between intron gains and richer alternative splicing profiles (via isoform productions or NMD) with new analyses (following comments #2 and #3; see below for details). Finally, the re-writing of the concluding paragraph of the article (in accordance with revisions #5, #6 and #7) is also meant to enhance the article’s take-home message. We indeed now mention the apparent lack of correlation between increasing organismal and genomic complexity in Holozoa. Results subsection “Consequences of intron gains in early holozoan evolution”: we now debate the evolutionary implications of intron gain episodes in Holozoa, first mentioning the possibility of a drift-driven change, and then elaborating on the nature of alternative splicing in non-animal eukaryotes (second paragraph). Since unicellular holozoans’ AS was likely dominated by intron retention (as seen in most eukaryotes (Irimia and Roy 2014; McGuire et al. 2008), Capsaspora (Sebé-Pedrós et al. 2013) and Creolimax (de Mendoza et al. 2015)), we link this argumentation with the survey of NMD and splicing factors’ evolution suggested by the reviewers (last paragraph; please see the answer to essential revision #3 for further details). Discussion subsection “Dating the origin of animal-like protein domain architectures, intron architecture and genome size”, second paragraph: we have added a more in-depth discussion of the evolutionary implications of intron gains in ancestral Holozoa (both in Metazoa and ichthyosporeans). We now cover the relative importance of exon skipping and intron retention in unicellular and multicellular holozoans (already present in the original submission); the fact that being able to perform NMD could have facilitated the intron invasion according to the population-genetic hypothesis mentioned in the reviewer’s suggestion; and the adaptive potential associated to high transcriptome variability in intron-rich genomes. In the Discussion section (aforementioned paragraph) we have added an assessment of the relative importance of adaptive and non-adaptive/neutral changes in intron evolution. Essentially, our data forces us to remain agnostic: population-level data is generally unavailable for unicellular holozoans (see forthcoming paragraph), and in-depth transcriptomic analyses are required to demonstrate specific adaptations by AS. We thus conclude that both mechanisms could have been in place, but that their relative importance remains an open debate. Multiple isolates are generally unavailable: the species here analysed are scarce in environmental surveys, and thus relatively difficult to isolate more than once (de Vargas et al. 2015). As a reference, the 7 teretosporeans included in this project are represented by ~30,000 reads of the 18S gene in the whole TARA Oceans global survey (99% of them correspond to Abeoforma, the others being virtually absent). These abundances are low: they represent just 0.006% of the eukaryotic reads, or 0.013% of the opisthokonts’. The only species for which population-level data is available (already mentioned in the manuscript; subsection “Consequences of intron gains in early holozoan evolution”, first paragraph) is Sphaeroforma tapetis, for which a typical eukaryotic effective population was inferred (10Moroz et al., 2014-10Srivastava et al., 2008) from multiple natural isolates (Marshall and Berbee 2010). The available cultures were grown in the lab for many years before sequencing, which precludes the indirect estimation of population sizes from heterozygosity levels due to the population bottlenecks imposed by isolation and artificial culture pressures. We agree this is a very interesting question. We have incorporated this suggestion, which we see as an interesting improvement of the manuscript that has enhanced our discussion of intron evolution regarding the major comment #2 as well (above). Thus, we have performed an evolutionary survey of the core NMD machinery, as defined in a recent review (He and Jacobson 2015), as well as the wider set of SR splicing factors (including SRSF5, mentioned by the reviewer) that are known to be involved in alternative splicing. This analysis is presented jointly with the intron site evolution analyses, and is shown in Figure 5, Figure 5—figure supplements 2 and 3 and Figure 5—source data 1. The NMD core machinery is ancestral to all eukaryotes and is thoroughly conserved in all the holozoan LCAs that underwent intron expansions (Holozoa, Ichthyophonida, Metazoa, Choanoflagellata…). However, it has undergone a notable reduction in Corallochytrium, concordantly with its reduced intron content. The animal SR splicing factors (according to their nomenclature in humans: SRSF1-9 andTRA2A-B) are present in all unicellular ancestors of Metazoa but have undergone partial secondary reductions in some unicellular holozoan lineages. As with NMD, Corallochytrium has the most depleted SR complement among unicellular holozoans. Other RNA-binding motifs that can intervene in the splicing process are nevertheless common in unicellular holozoans, with ~100 motifs per genome – in line with other eukaryotes, but less than most metazoans (~300 in H. sapiens, ~200 in N. vectensis, etc.). We thus conclude that the intron gain episodes of holozoans occurred in ancestral organisms that were potentially able to perform NMD of aberrant transcripts. This result fits the proposal that intron gain episodes can be linked with active NMD, as regulated removal of aberrant transcripts can decrease the cost of increased intron contents (Lynch 2006). These results are now exposed in the Results section (subsection “Consequences of intron gains in early holozoan evolution”) and further explored in the Discussion (subsection “Dating the origin of animal-like protein domain architectures, intron architecture and genome size”; please see response to comment #2 for further details). We have also updated the Materials and methods section to explain the homolog search procedure used for each of these gene families (subsection “Retrieval of homologous sequences”). 4) Was there any signal in the protein domain network generation of and evidence of more promiscuous domains – in terms of enzymatic, structure proteins or any signals that relate to protein-protein interactions changes too? Or is this all fully captured in the graphs? Furthermore, in order to make clear the contribution of protein-binding domains to the higher domain promiscuities exhibited by metazoans, we have expanded the Figure 8 supplement to include the per-species promiscuities of the sub-networks mentioned in Figure 7B’s right panel: ECM, signalling, ubiquitination and protein-binding domains, in addition to TFs (already shown in the main Figure 8). One cannot tell if the types of domains that are playing a role in the changes (seen increasing in 6B – Metazoa) are mostly the classes highlighted at right or if any others come into play – if the authors are taking a candidate family focused approach here but are also able to discover other types of expansions? In order to facilitate the interpretation of the data presented in Figure 7—source data 2 (gains of protein domain combinations in various ancestors), we have added a new source data table (Table 1—source data 1) that includes all the protein domain combinations present in the LCA of Metazoa and their gain probabilities in eukaryotic ancestral nodes. Table 1—source data 1 has the same format as Table 1 and is directly produced from the Figure 7—source data 2 dataset; thus, readers can readily build similar tables for their nodes or gene families of interest. Finally, we would like to argue in favour of our candidate-focused approach. Automatic associations of protein domains and functional terms (e.g., gene ontologies [GO]) in unicellular holozoans are heavily biased by studies in animal model organisms. For example, protein domains that appear in the animal ancestry (TFs, ECM…) are often associated with GO terms that are meaningless in unicellular contexts (development, organismal communication…). This dissonance obscures the interpretation of downstream analyses such as GO enrichment tests, as it becomes difficult to distinguish functional mis-annotations from real but imprecisely-named GOs. Relying on curated lists of domains helps overcome this problem. We took the liberty of answering remarks #5 and #6 together, as they are both related to similar statements in the last paragraphs of the manuscript. We agree that the above-mentioned sentences convey a sense of opposition between genome evolution pre- and post-metazoan origins. We would not agree with this proposition as a general principle, neither under the light of our own results nor of the accumulating knowledge regarding genome evolution (as the reviewers highlight). Furthermore, previous investigations of holozoan genomics regarding gene content actually led us to expect quite the opposite: that unicellular relatives of animals, extant or ancestral, do not have “simpler” genomes with “static” architectures/contents. Indeed, we formalized this expectation in our study whenever possible – e.g., we hypothesized that intron-richer ichthyosporeans and animals would descend from a single pan-holozoan intron gain episode (admittedly, the hypothesis was false). We have completely rewritten this paragraph to amend these incongruences (subsection “Genomic innovation in the animal ancestry”). We now start by overviewing the classical features of complex animal genomes, some of which are also frequent (and actually emerged) in premetazoan lineages. Then, we discuss how our analyses have clarified the timeline of genome architecture evolution (relatively overlooked outside of metazoans) and summarize the overlapping evolutionary dynamics described in the paper. In this concluding paragraph, we nevertheless refrain from linking our results with changes of effective population sizes/cell type origin/true multicellularity: as explained above, we prefer to refer to these issues on a per-analysis basis, earlier on in the Discussion section. Incidentally, we think that amending this last paragraph also helps to address the concerns expressed in the comment #1 regarding the unclear take-home message. This particular sentence was meant to emphasize, in a literary manner, the dynamism of genome evolution in unicellular animal ancestors. It has similar implications as the controversial sentences indicated in comments #5 and #6. Thus, as part of the rewriting of this paragraph (subsection “Genomic innovation in the animal ancestry”), we have now deleted this sentence. This work was supported by an ERC Consolidator Grant (ERC-2012-Co-616960), support from the Secretary's Office for Universities and Research of the Generalitat de Catalunya (project 2014 SGR 619) and two grants from the Spanish Ministry for Economy and Competitiveness (MINECO; BFU2011-23434 and BFU2014-57779-P, the latter with European Regional Development Fund support), all to IRT. XGB was supported by a pre-doctoral FPI grant from MINECO (except for the January-March 2015 period). GT was funded by a European Marie Skłodowska-Curie Action (704566 AlgDates). HS was supported by JSPS KAKENHI 16K07468 and research grants from the NOVARTIS foundation for the Promotion of Science, ITOH Science Foundation, and JUTEN grant from the Prefectural University of Hiroshima. We thank Krista M. Nichols (NOAA Fisheries) and Chris Whipps (SUNY-ESF) for sharing their assembly of Ichthyophonus hoferi. We warmly acknowledge the help of Arnau Sebé-Pedrós and Alex de Mendoza for their invaluable comments on the manuscript; and thank Meritxell Antó, Elisabeth Hehenberger, Manuel Irimia, David López-Escardó, Jordi Paps, Dan Richter, and Valèria Romero-Soriano for their technical assistance and insightful remarks on the study. We thank​ Sebuastián R. Najle for his insightful observations on Chromosphaera perkinsii, which led to its naming. © 2017, Grau-Bové et al.